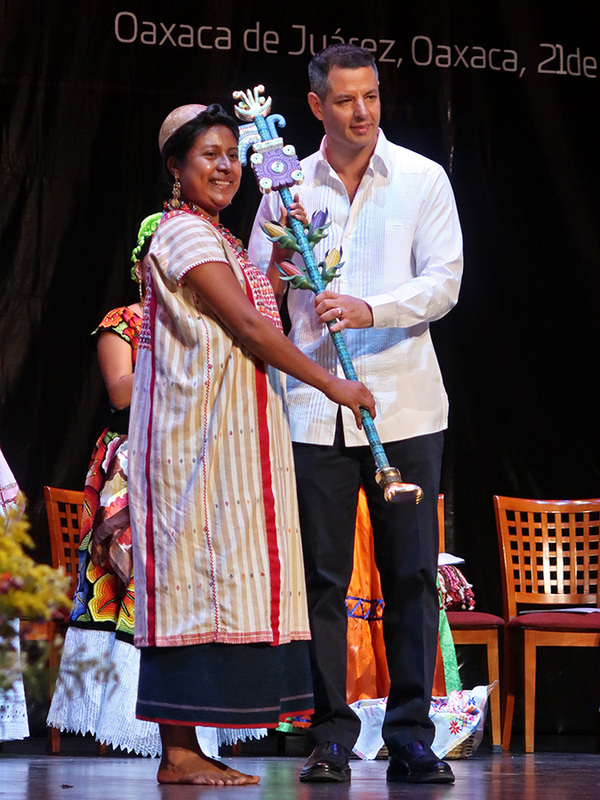 2019 has been proclaimed the International Year of Indigenous Languages by the United Nations. 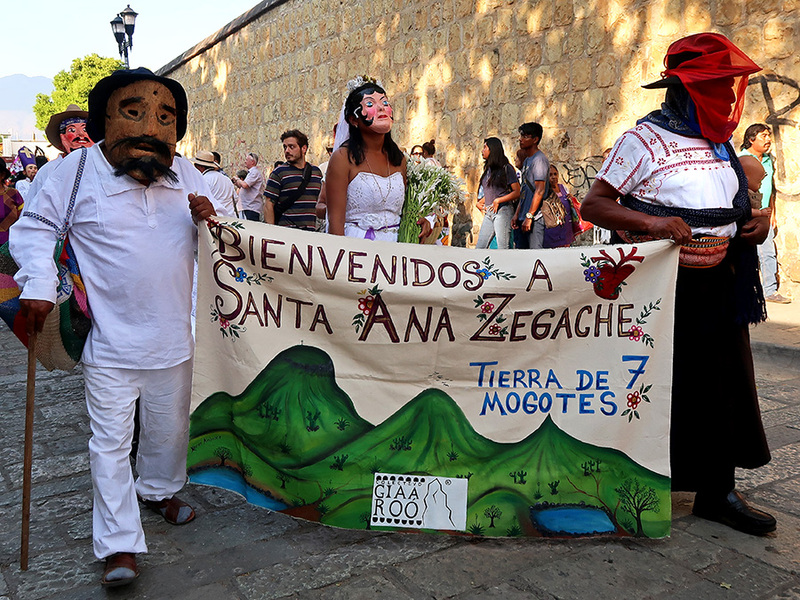 The issue of “lenguas maternas” (mother tongues) has a particular resonance in Oaxaca, as the state is home to 16 distinct ethnolinguistic groups: Amuzgos, Chatino, Chinanteco, Chocho, Chontal, Cuicateco, Huave, Ixcateco, Mazateco, Mixe, Mixteco, Náhuatl, Popoloca, Triqui, Zapoteco, and Zoque. 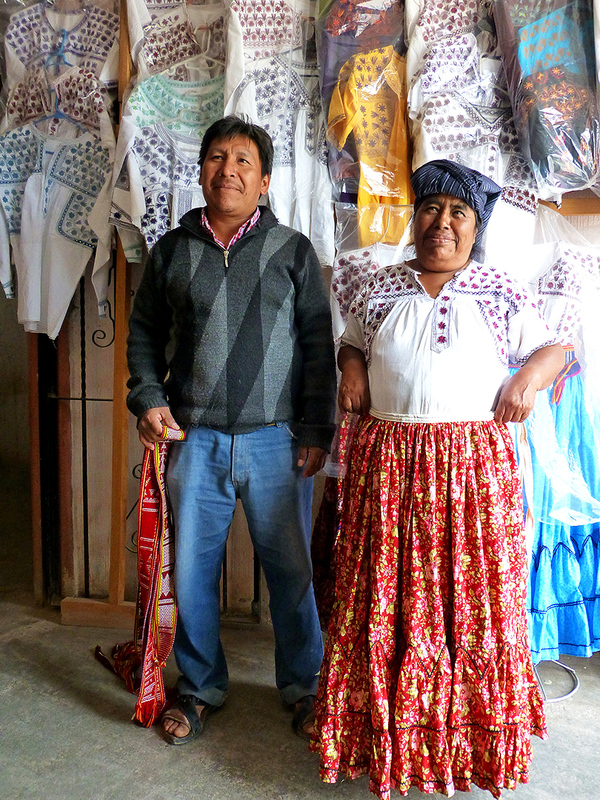 As anyone who has visited the villages of Oaxaca has discovered, sometimes the abuelos and abuelas only speak their mother tongue, not Spanish. 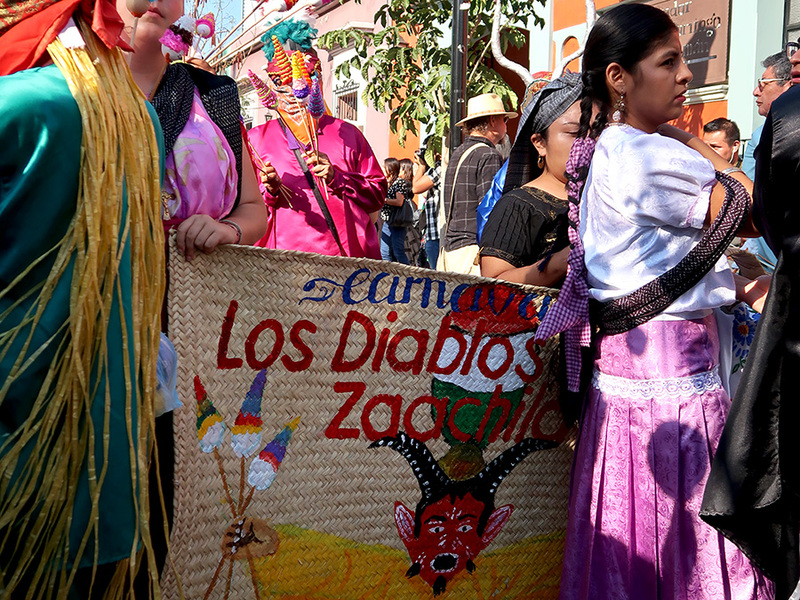 To honor and celebrate them, their ancestors, and their children and grandchildren, today on the zócalo, Oaxaca celebrated those languages with songs, poetry, and recitations. 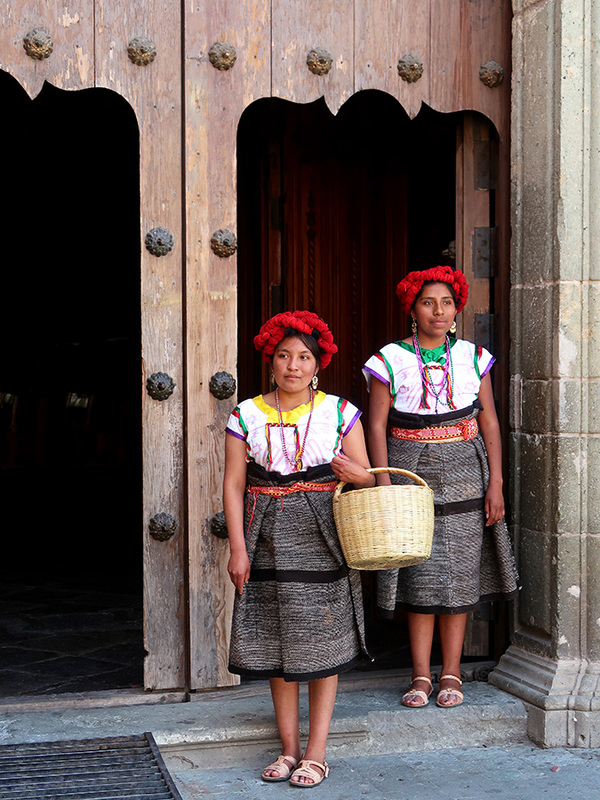 However, like indigenous languages throughout the world, Mexico’s indigenous languages are in danger of disappearing. The importance of passing these languages and the world views they express to the younger generations cannot be underestimated. 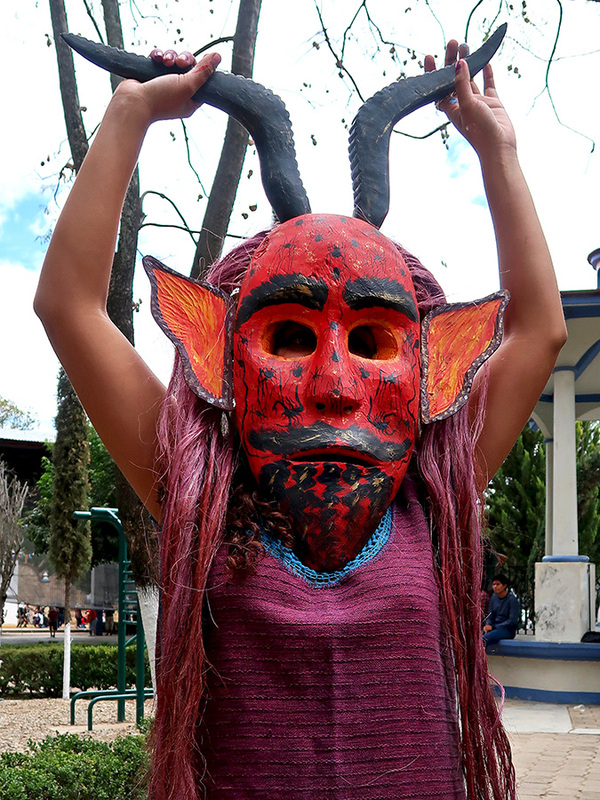 Thus here in Oaxaca, on February 21, 2019, Mother Language Day, you can walk “The roads of the feathered serpent: revaluing one of the variants of the Zapotec Valley of Oaxaca” and “Meet the Zapotec of Teotitlán through storytelling and other activities!” at the Biblioteca Infantil (Children’s Library). The United Nations declared November 20 as Universal Children’s Day. 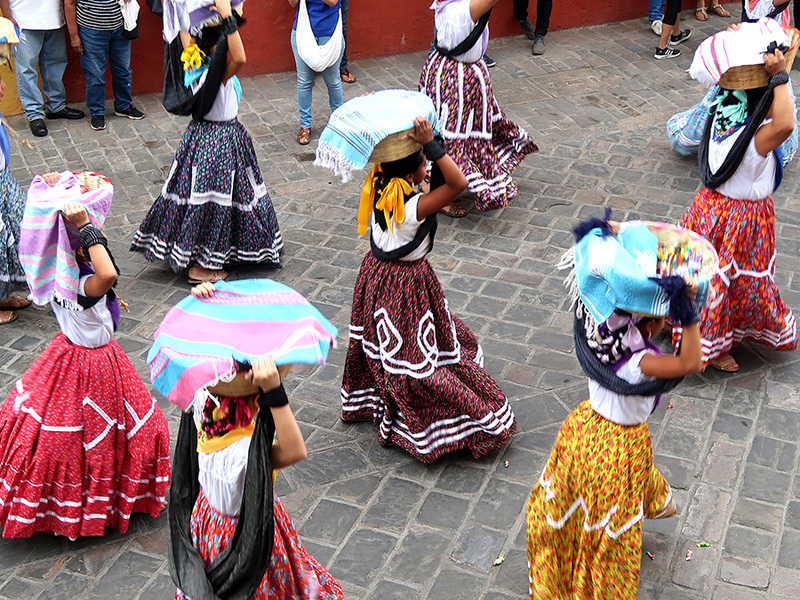 However, that is Día de la Revolución in Mexico, thus April 30 was designated Día del Niño — the day Mexico celebrates her children. Schools organize parties with games and treats, communities organize special activities, and parents may give their hijas and hijos gifts. What can I say? Lately, I have been having way too much fun to blog. 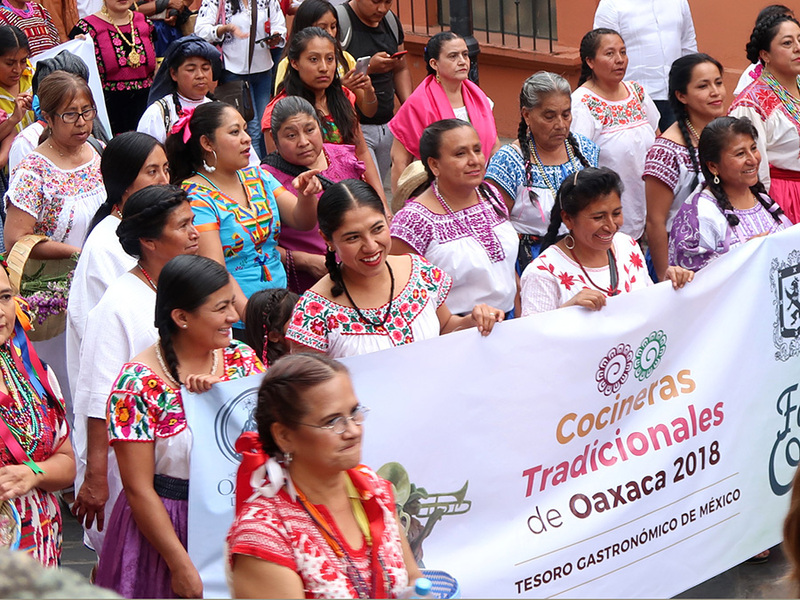 A Gran Convite on Tuesday evening kicked off the festivities celebrating Oaxaca’s 486 birthday and inviting one and all to the previously mentioned, 2nd Encuentro de Cocineras Tradicionales de Oaxaca opening the following day. 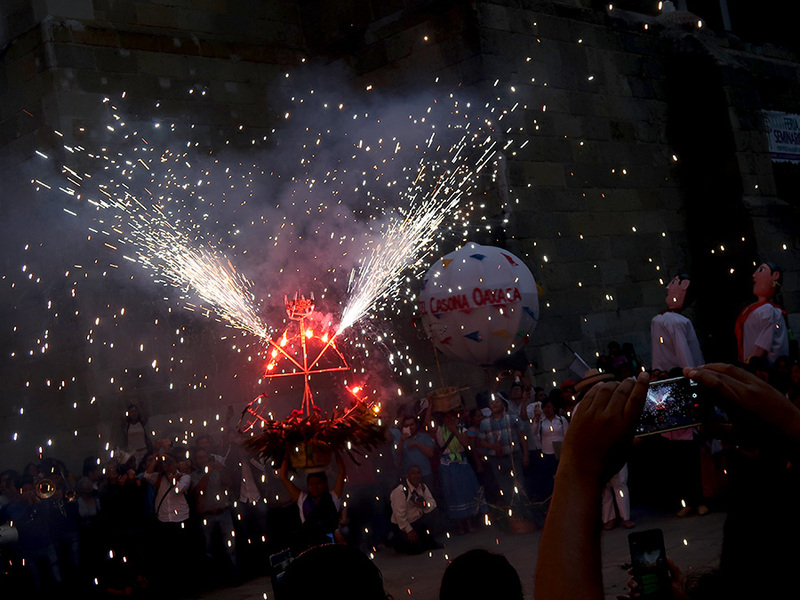 Beginning at the Cruz de la Piedra, the parade came to a sparkling climax in front of the Cathedral. 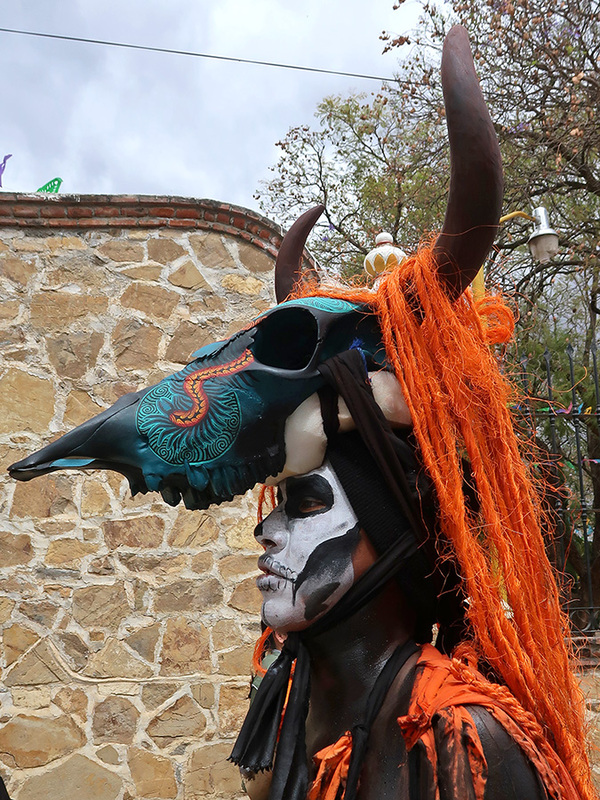 Wednesday began with an early morning ringing of the Cathedral’s bells (and several other churches, I’m pretty sure) and the booms and bangs of cohetes announcing Oaxaca’s official birthday. 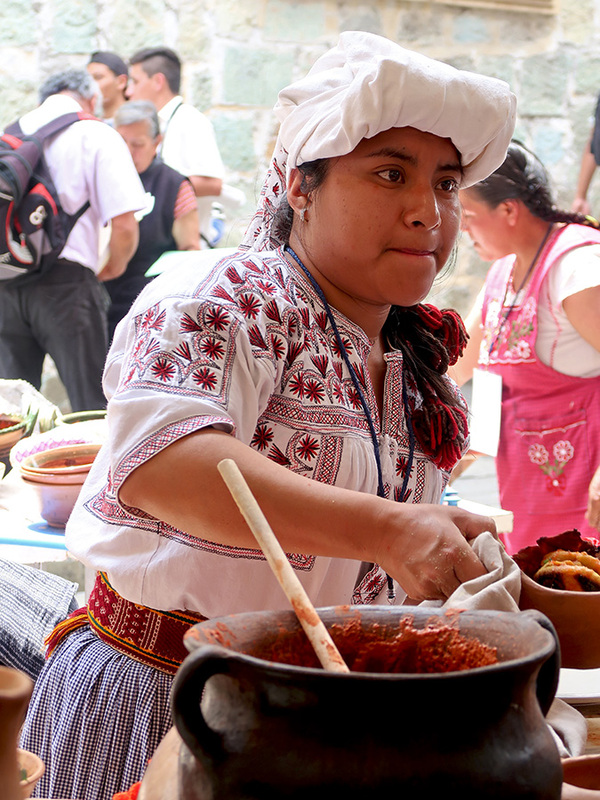 Then the event that I had been hungrily awaiting — the opening of the four-day gathering of Oaxaca’s traditional cooks at the Plaza de la Danza. It was worth the wait! 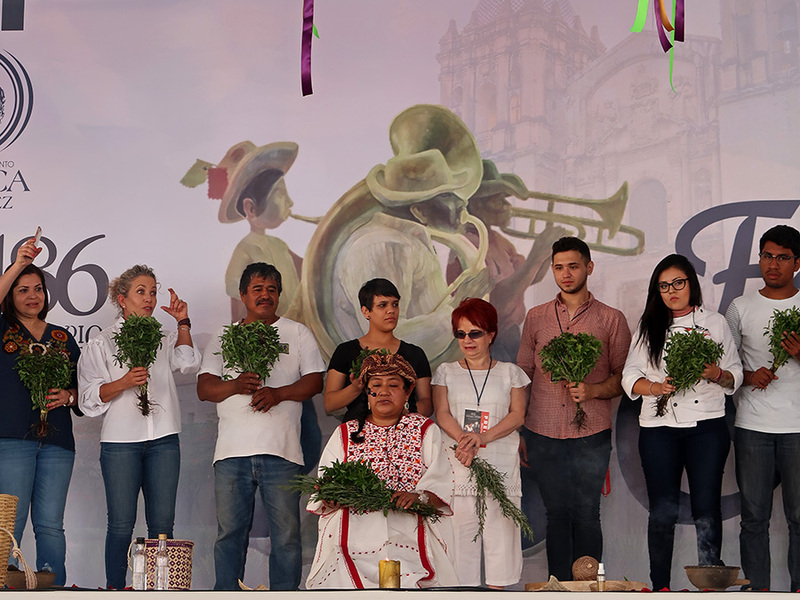 Mixtec ritual of Aromas y Sabores del Alma using basil and rosemary to open Encuentro de Cocineras Tradicionales de Oaxaca. 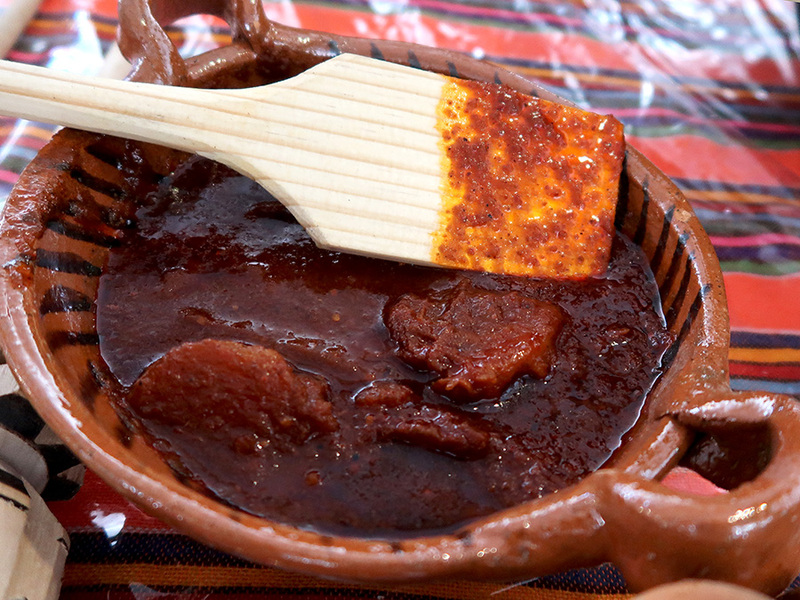 Machacado mixe, Caldo mixe from Santa María Tlahuitoltepec in the Sierra Norte. 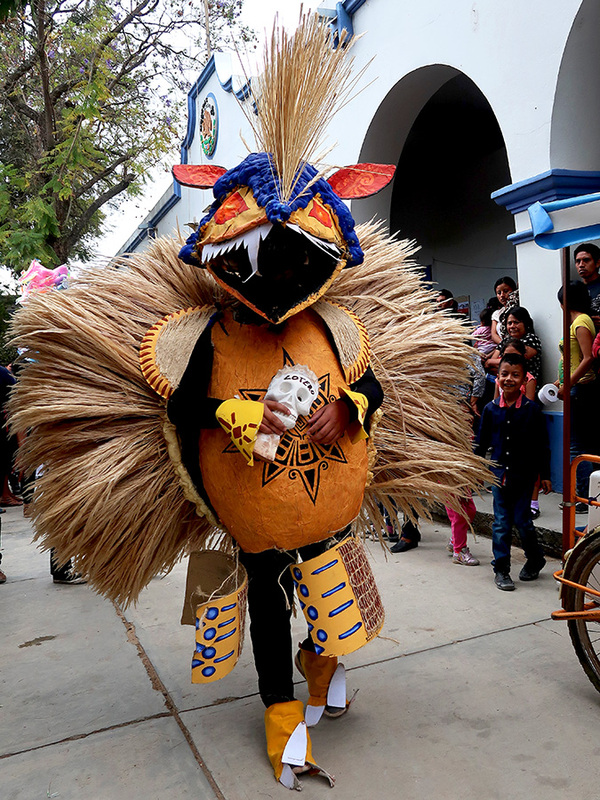 Chileajo amarillo from Huayuapan de León in the Mixteca. Ingredients on display by Carina Santiago of Tierra Antigua restaurant in Teotitlán del Valle, in Oaxaca’s Valles Centrales. 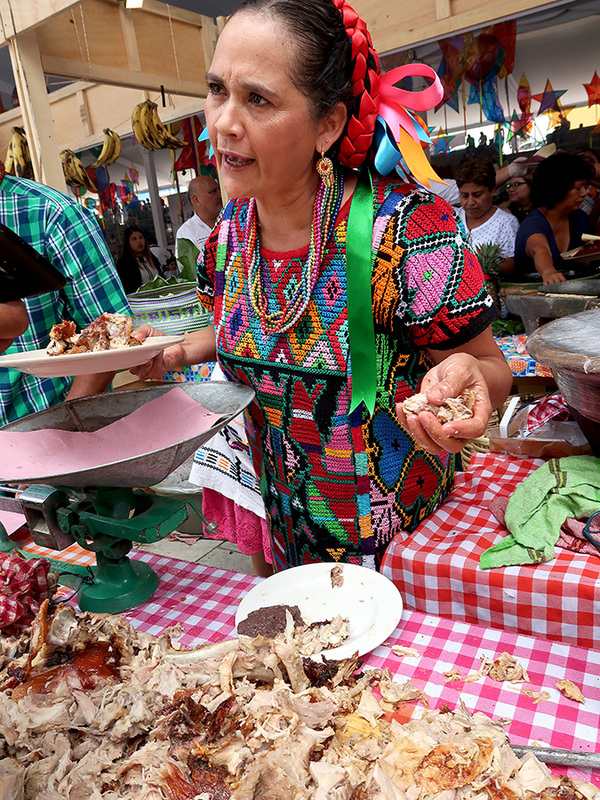 Cochino a la cubana from the Papaloapan region of Oaxaca being served by cocinera Rosario Cruz Cobos. 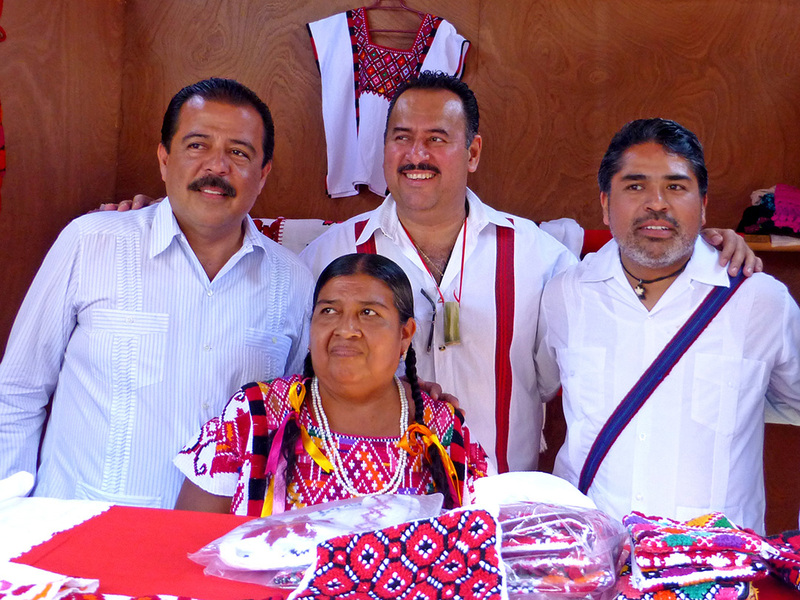 There is also an expo-venta of Oaxacan artesanía at the Palacio Municipal adjacent to the Plaza de la Danza. 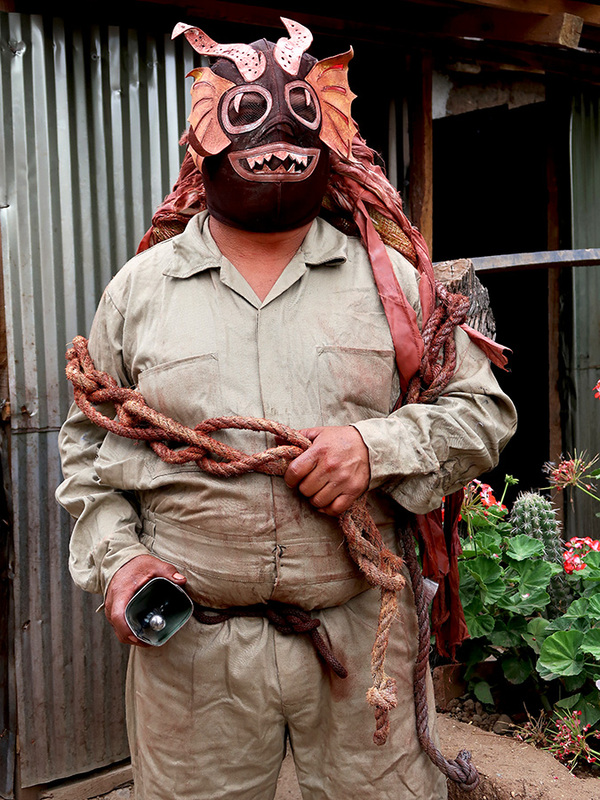 Some of the best red clay pottery from San Marcos Tlapazola for sale. 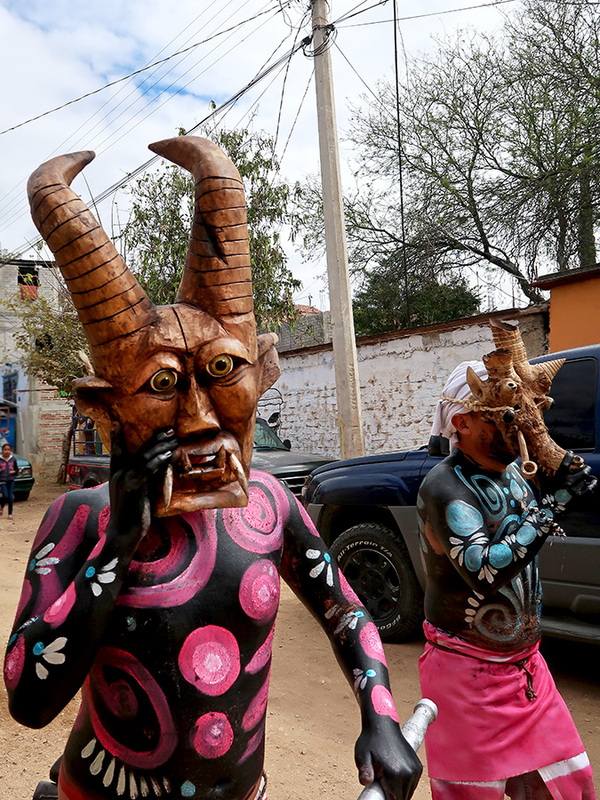 I took yesterday off to do my volunteer gig at the Oaxaca Lending Library, but I’m returning to the Encuentro today, right after I post this. My stomach is already rumbling! It’s been all about boys in my family — two sons, a stepson, and a grandson. That is, until eleven months ago when finally a girl — my granddaughter — made her much welcomed entrance into the world. Of course she is adorable, but so were her brother, dad, and uncles. 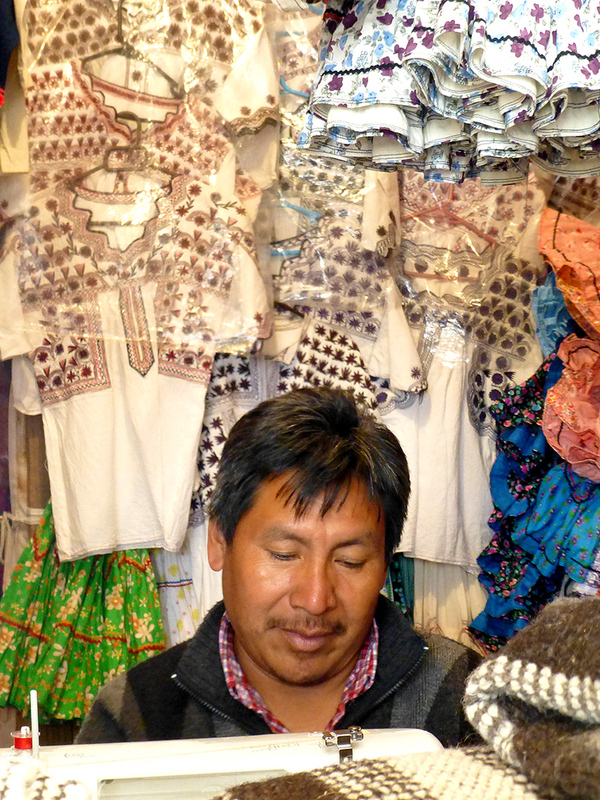 However, I must admit that clothes shopping for a little girl is so much more fun, especially here in Oaxaca. 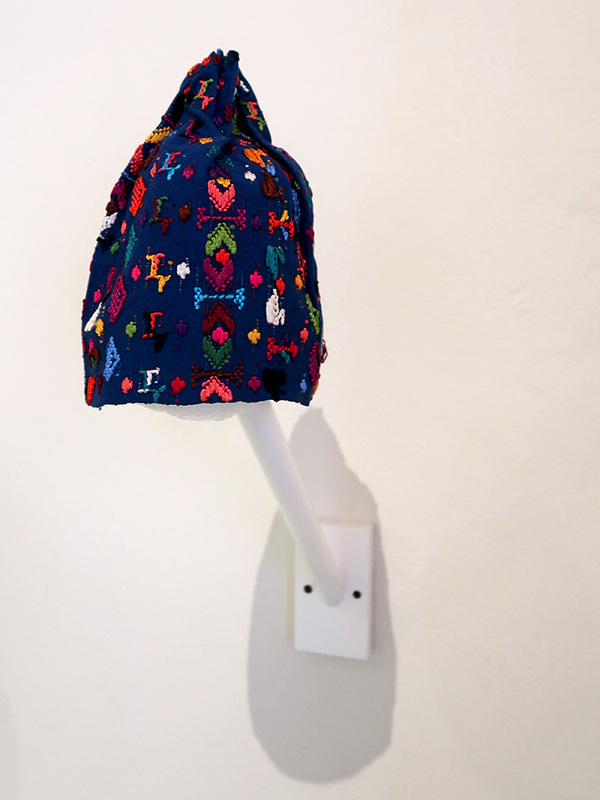 Cotton baby hat – probably Santiago Mexquititlán, Querétaro, Mexico (c. 1960) Otomí village. 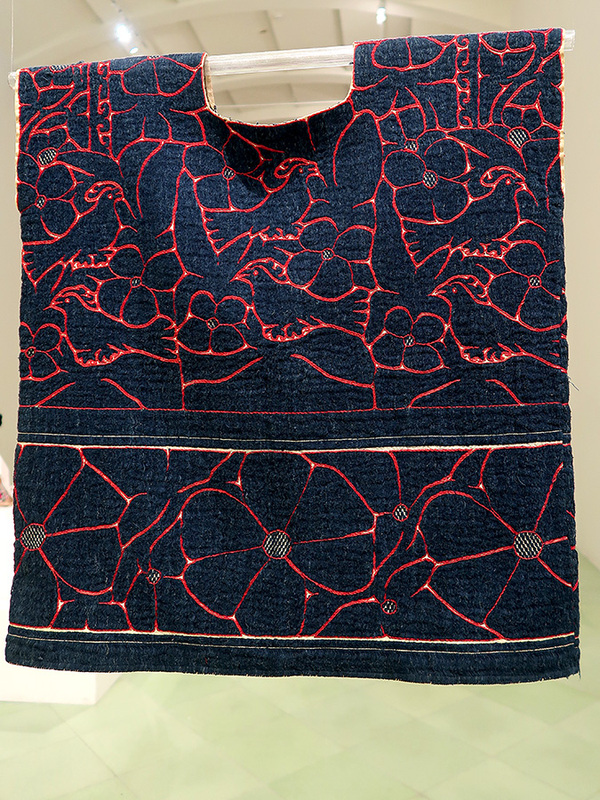 Woven baby hat – San Lucas Tolimán, Guatemala (c. 1990s) Tz’utuoil community. 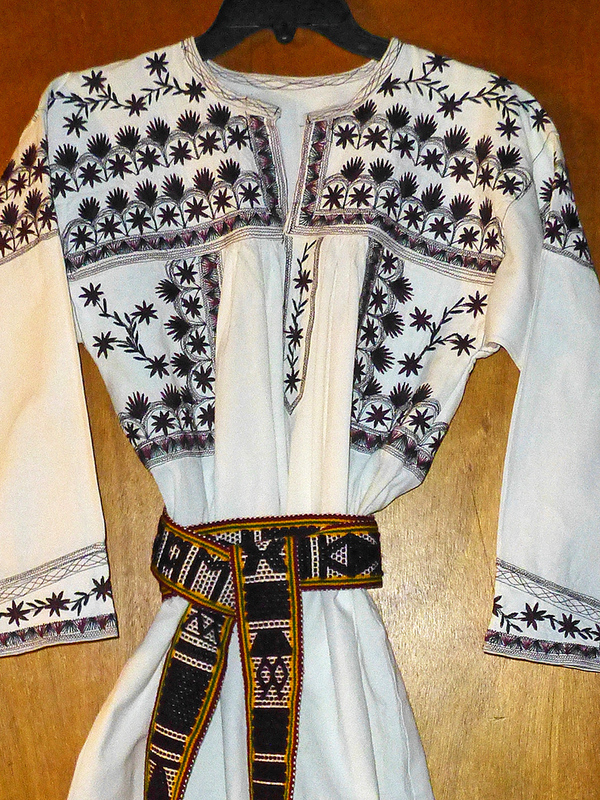 Girl’s huipil from Palín, Guatemala (c. 1980s). 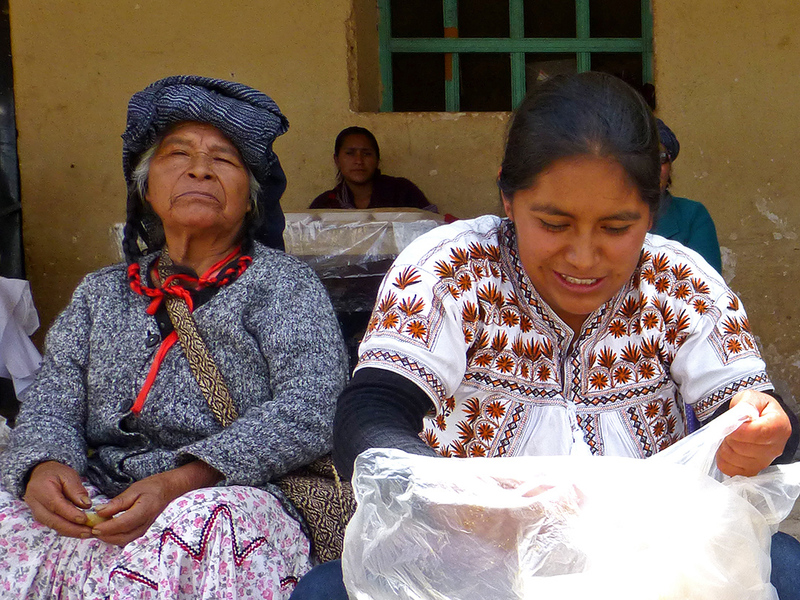 Community speaks Pokomam, a Mayan language. 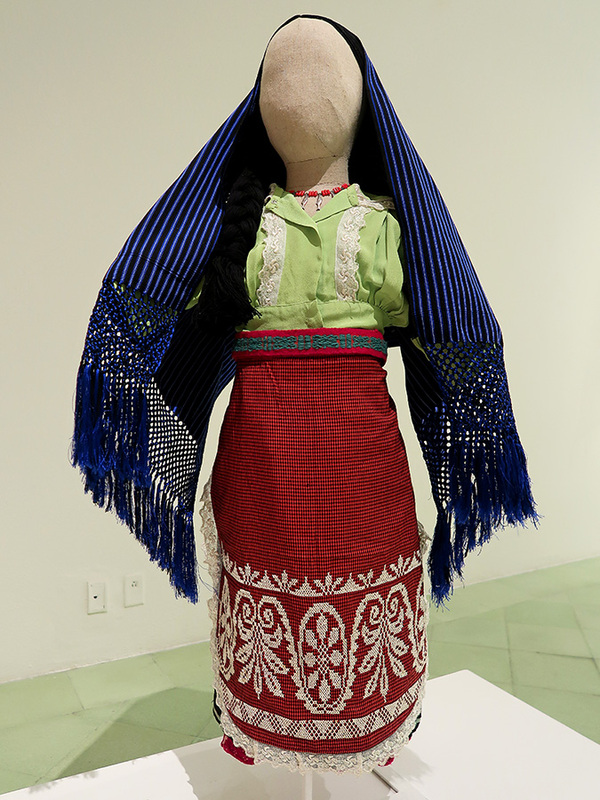 Girl’s huipil from San Bartolomé Ayautla, Oaxaca, Mexico. (c. 1950s) Mazateco community. 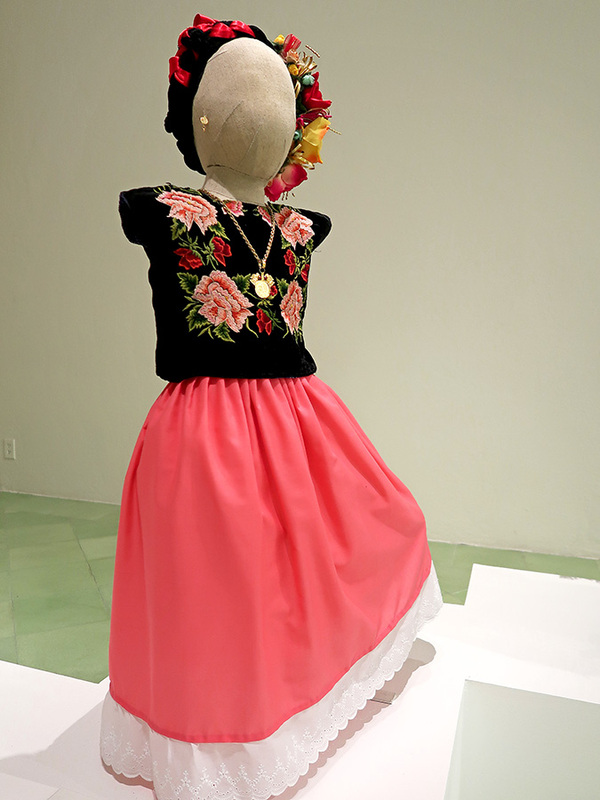 Girl’s clothing from Pátzcuaro, Michoacán, Mexico. (c. 1940s) Purépecha village. 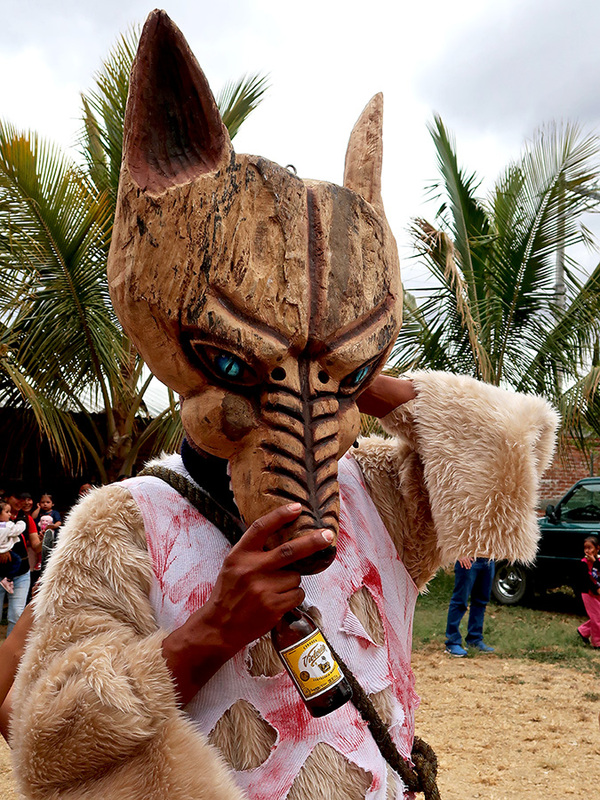 Costume of baptism – Chachahuantla, Puebla, Mexico (1999-2017) Community speaks Náhuatl. 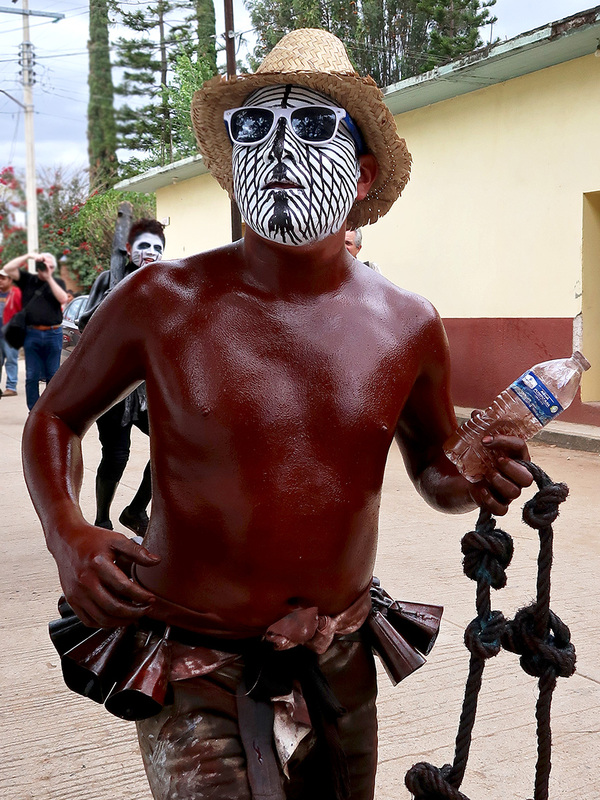 Venustiano Carranza, Chiapas, Mexico (c. 1950s). Tsotsil village. 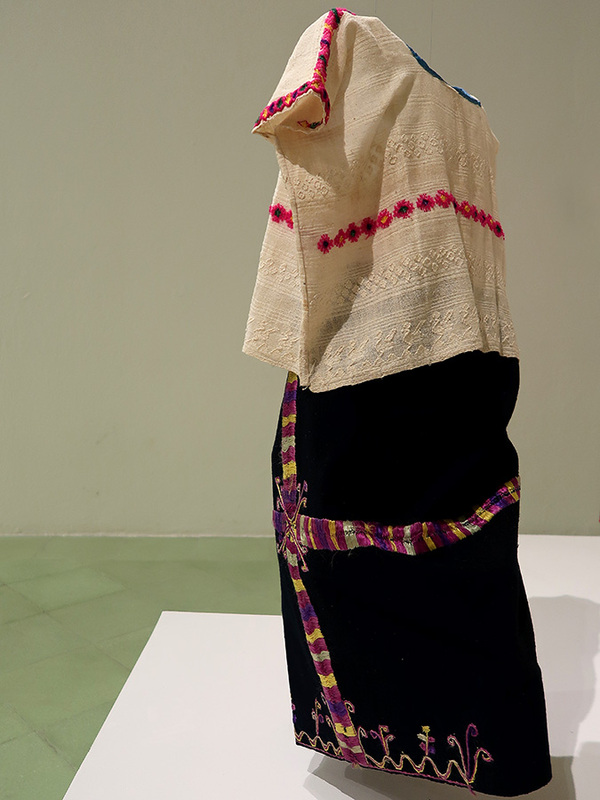 Huipil of black velvet with cotton embroidery from districts of Juchitán and Tehuantepec, Oaxaca, Mexico. (c. 1950-1960) Zapotec communities. Villa Hidalgo Yalálag, Oaxaca, Mexico (c. 1990). 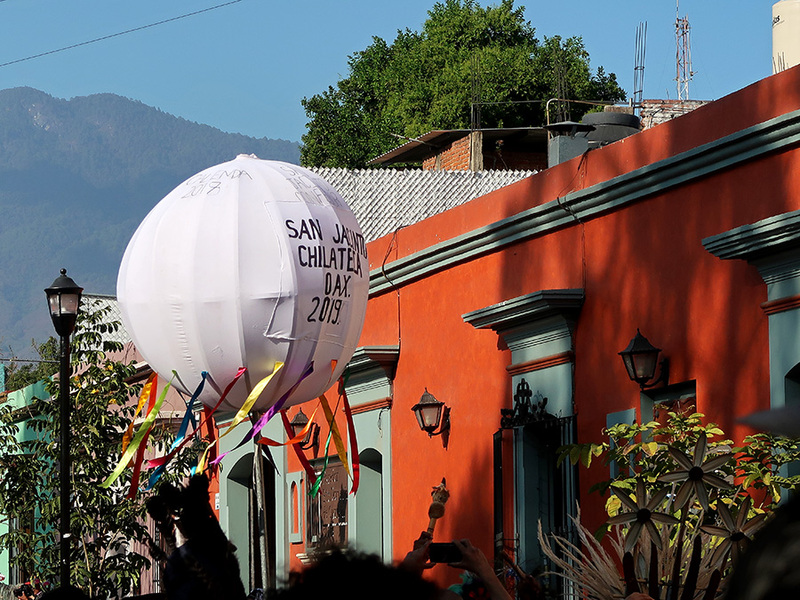 Zapotec village. Villa Hidalgo Yalálag, Oaxaca, Mexico (c. 1990). 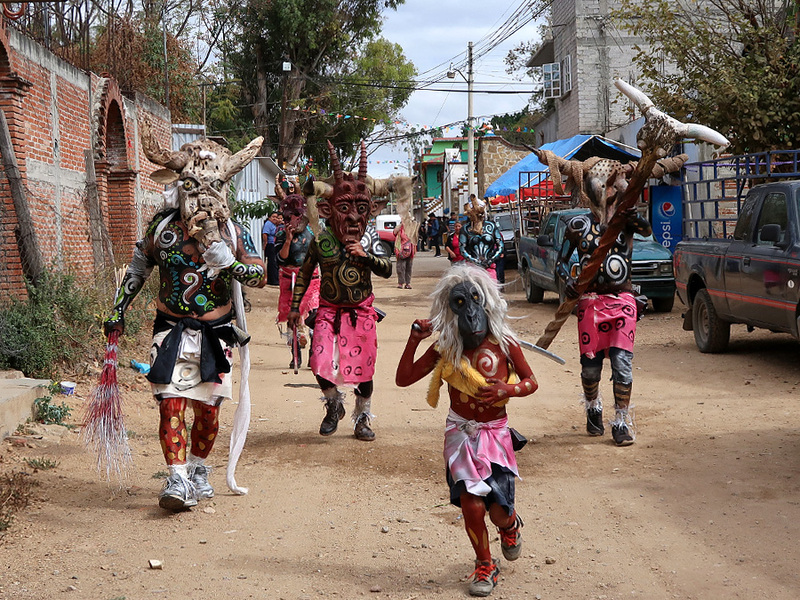 Zapotec village. 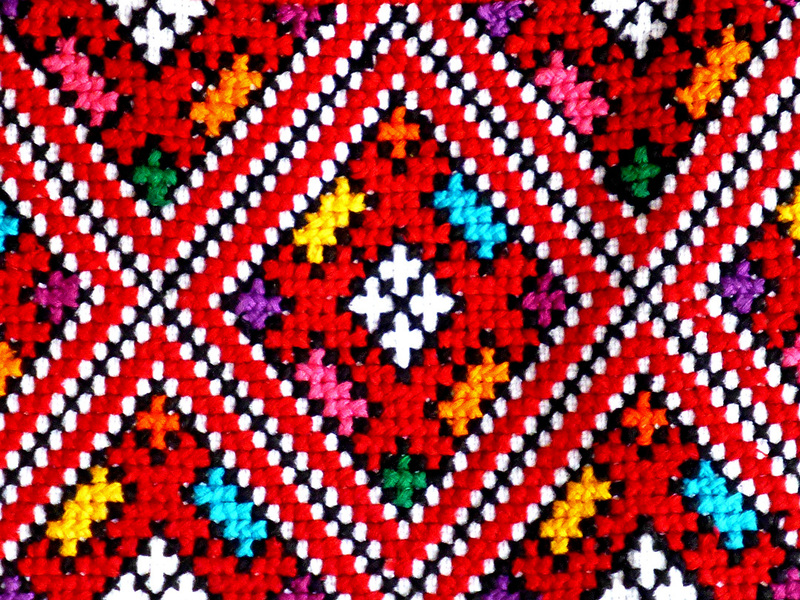 Embroidery detail using rayon threads. 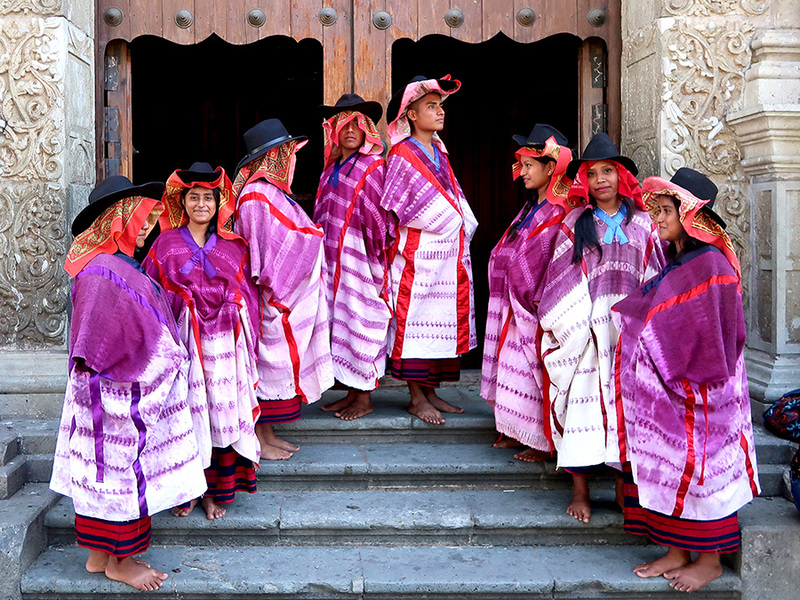 It isn’t just the girls who are dressed with love in these indigenous communities. The clothing of the boys is also just as lovingly detailed and decorated. 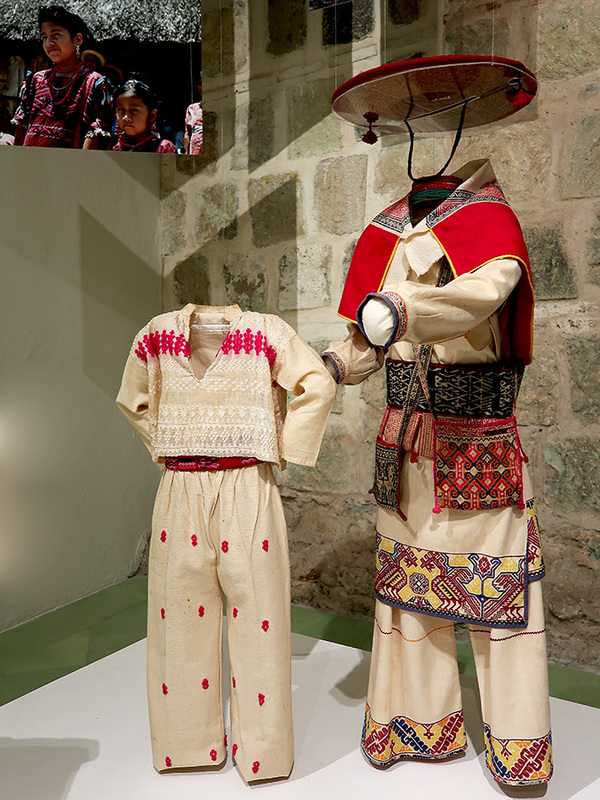 Boy’s clothing from San Andrés Tzicuilan, Puebla, Mexico. 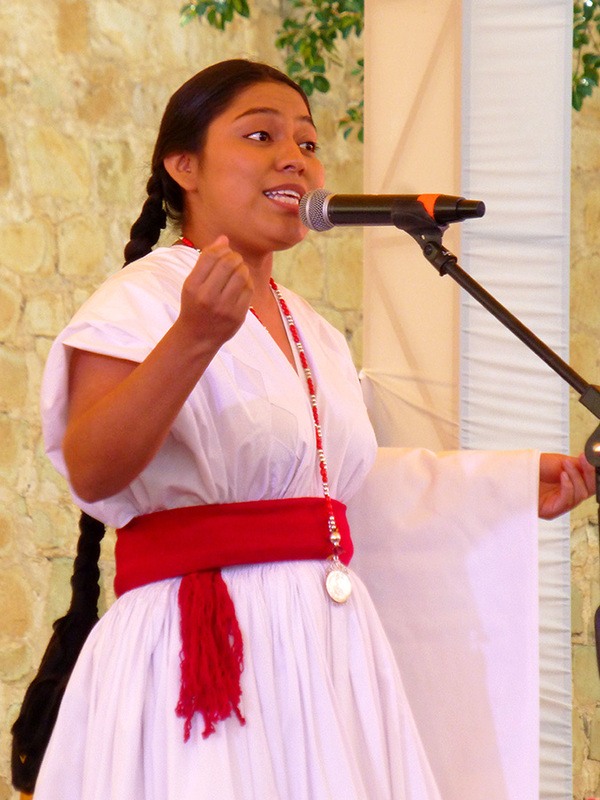 (c. 1988-1993) Community speaks Náhuatl. 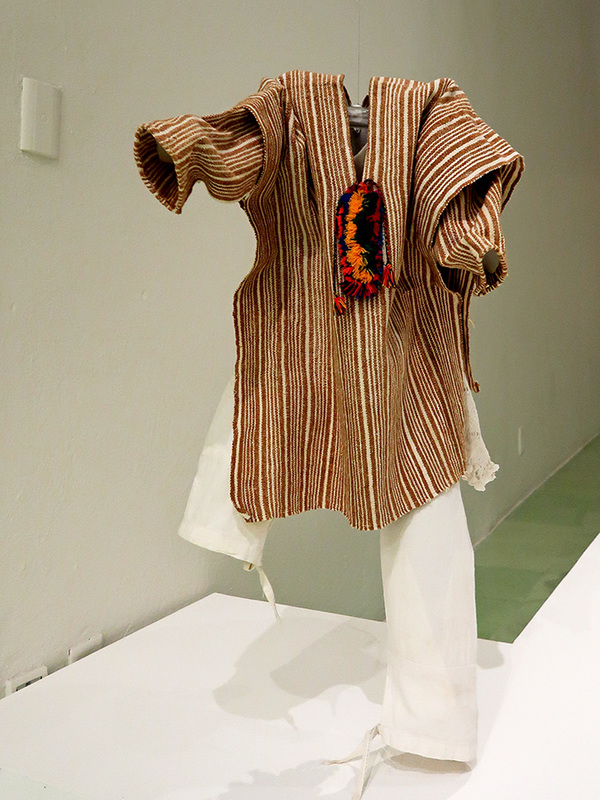 Boy’s clothing from Santiago Ixtayutla, Oaxaca, Mexico. (c. 1990s) Mixtec village. 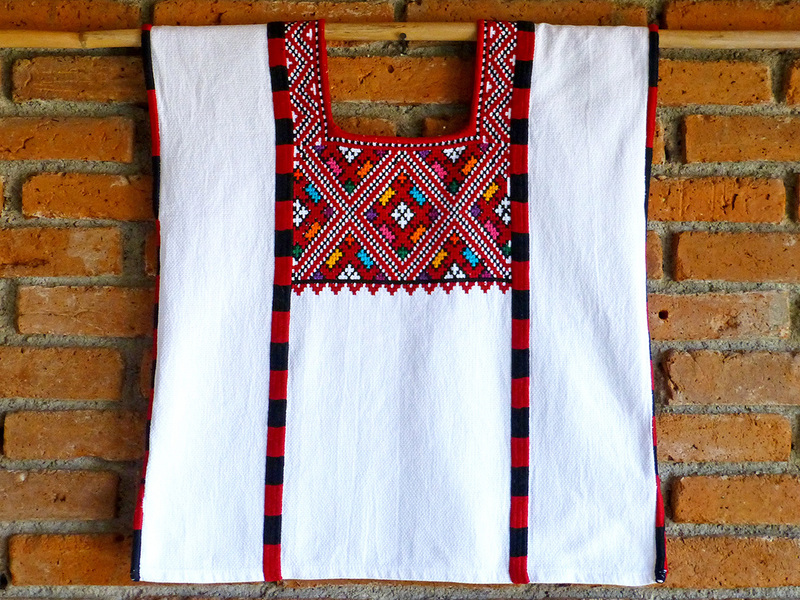 (R) Boy’s clothing from Venustiano Carranza, Chiapas, Mexico. (c. 1950s). Tsotsil village. 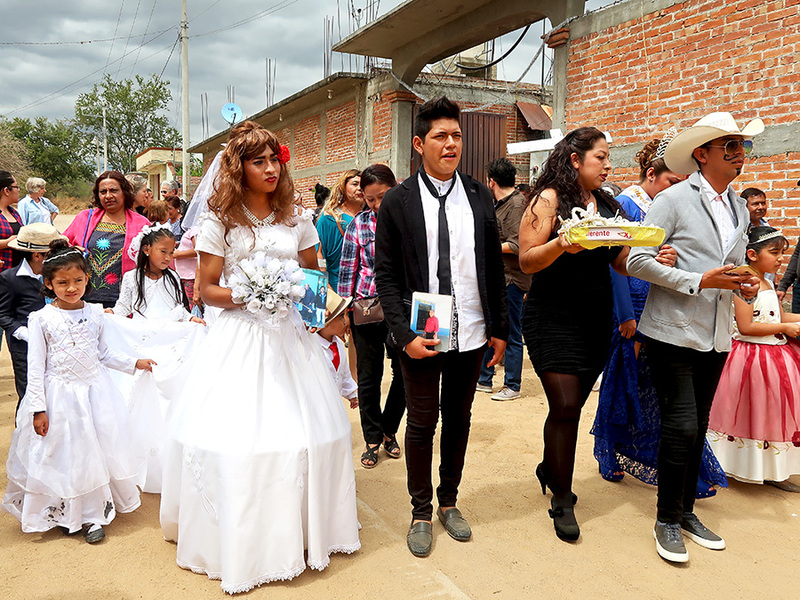 (L) Teen boy’s clothing from Sierra Madre Occidental to the north of Jalisco and east of Nayarit. (c. 1930s) Wixárika (Huichol) community. 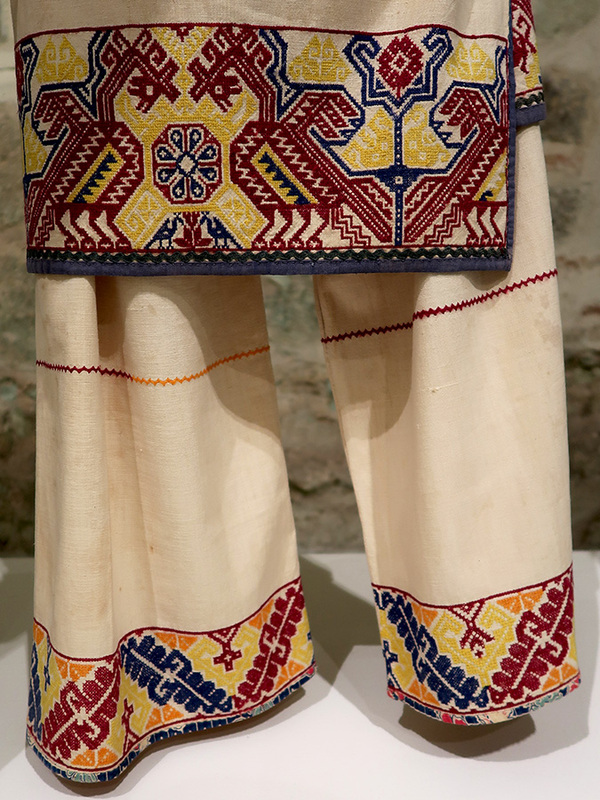 Detail from teen boy’s clothing from Sierra Madre Occidental to the north of Jalisco and east of Nayarit. (c. 1930s) Wixárika (Huichol) community. 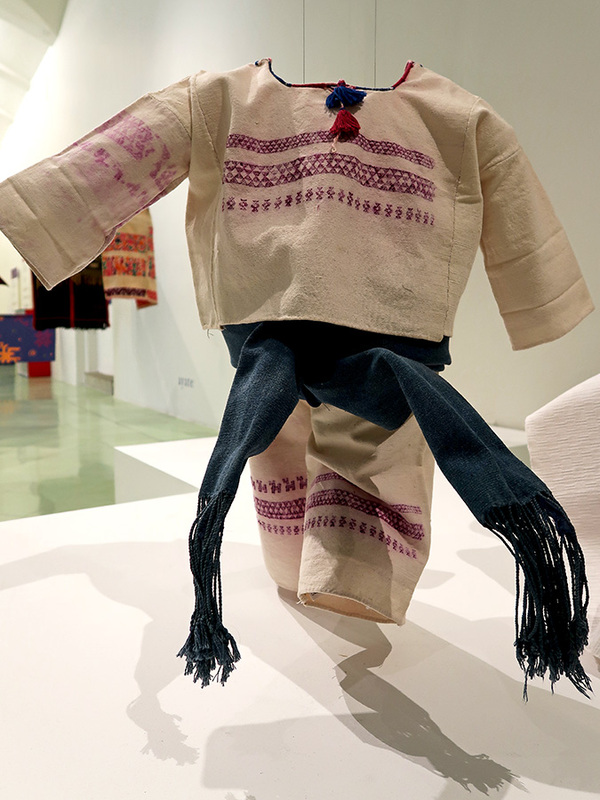 There are so many more pieces to see and there is even an interactive component for children — a play area where they can assemble and decorate textile pieces. 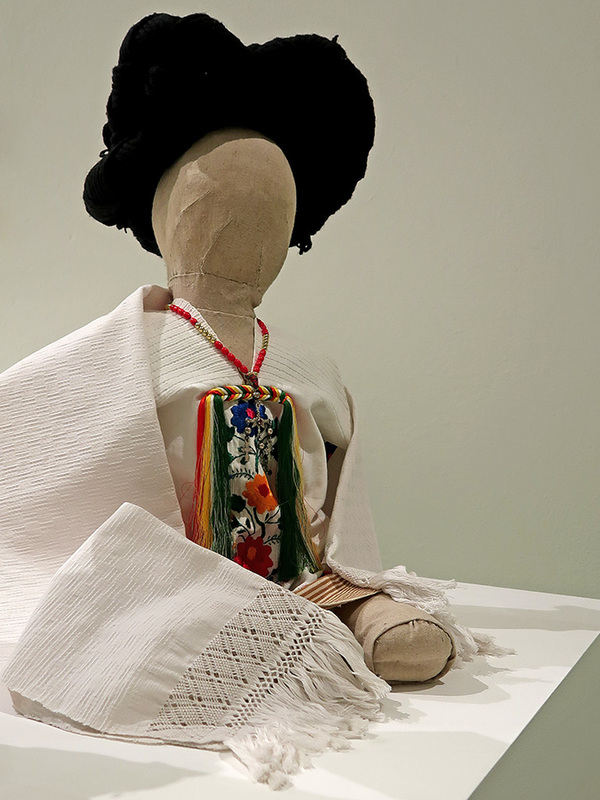 The Museo Textil de Oaxaca is located at Hidalgo 917, at the corner of Fiallo and the exhibition, in the Caracol room, runs until July 1, 2018. 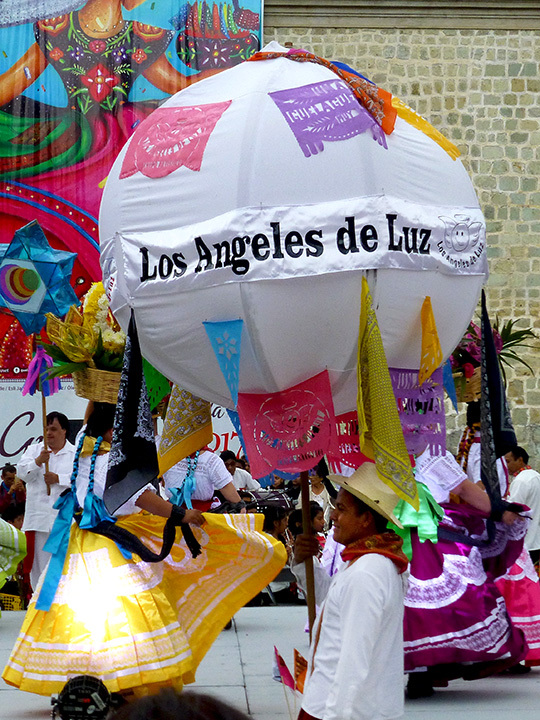 The Guelaguetza Muy Especial, danced by Los Ángeles de Luz, gets bigger every year. 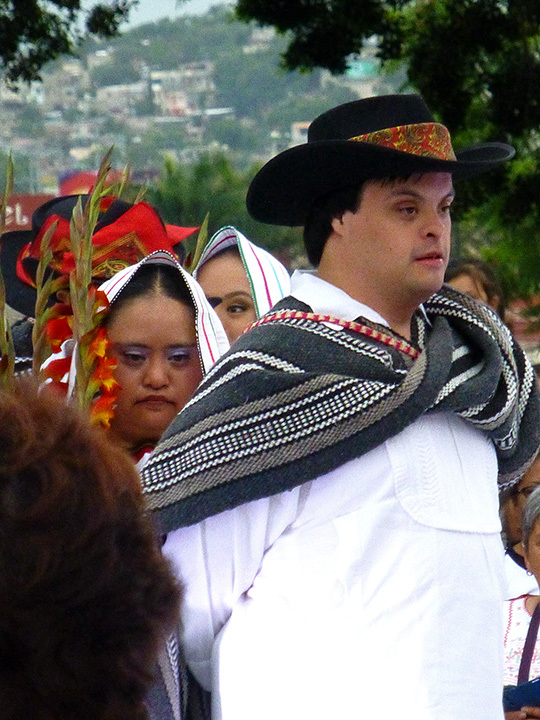 Early yesterday evening, all seating was filled and it was standing room only at the Plaza de la Danza — and that is a very good thing because Los Ángeles de Luz is group of 18 children and young people with Down’s Syndrome. 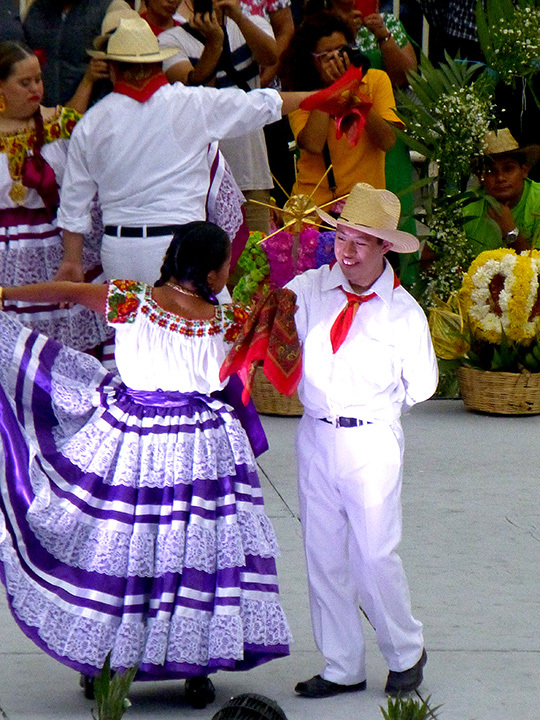 At the Guelaguetza Muy Especial, these young people make the requisite costume changes and perform traditional dances from the eight regions of Oaxaca. 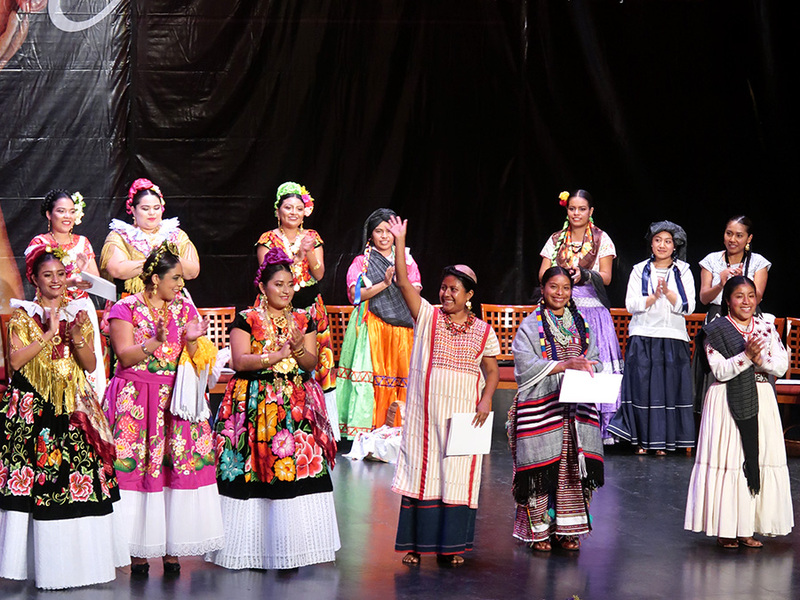 This year’s show brought Oaxaca’s dignitaries, including Diosa Centeotl, Rebeca Itahí Ortiz Santibañez — she looked incredibly moved when they performed dances from her town of San Melchor Betaza. As I have mentioned before, perhaps it is because I have a special needs nephew or that both my sister-in-law and daughter-in-law are special education teachers, that I am drawn to this event every year. 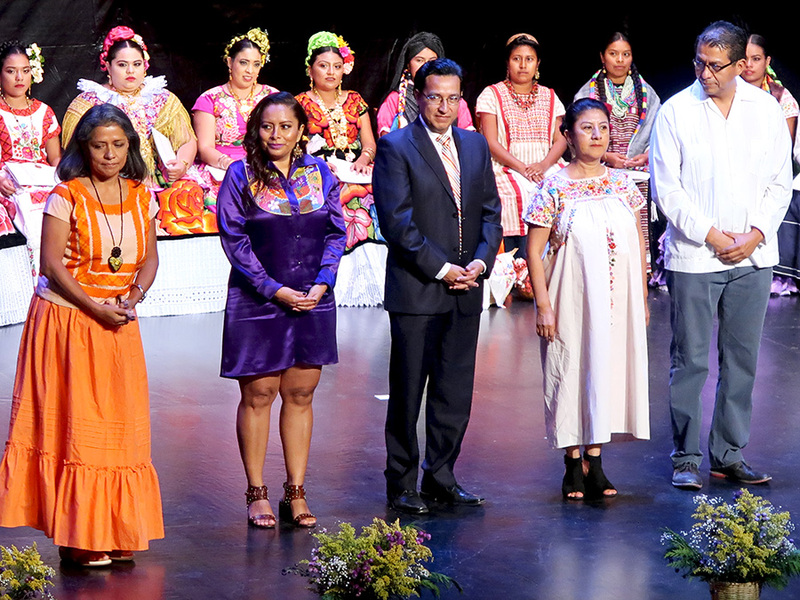 Tears always well up in my eyes as I share in the joy and pride exhibited by the dancers from Los Ángeles de Luz. 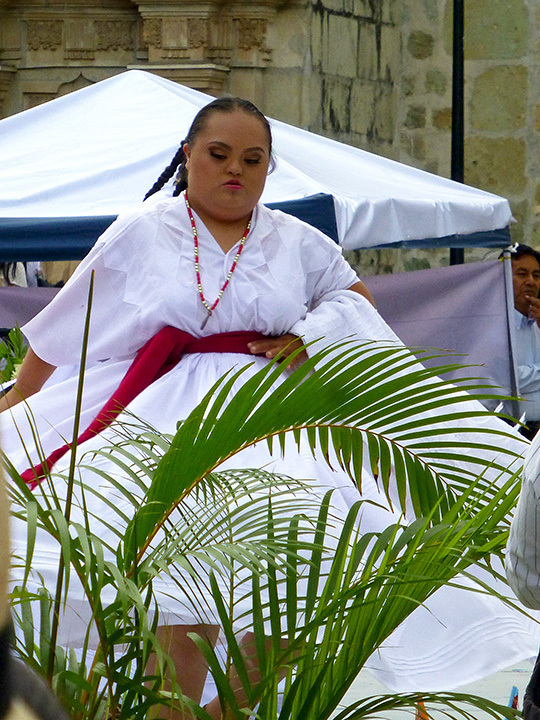 The competition to be Diosa Centéotl is not a Miss Universe/Miss America style beauty pageant. 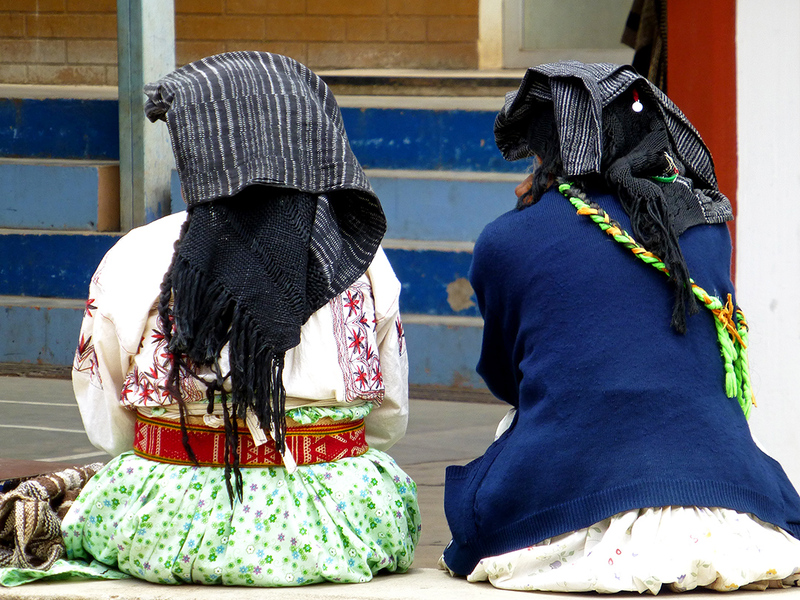 Dressed in the typical costumes of their villages or neighborhoods, these young women had to communicate their knowledge of their communities. 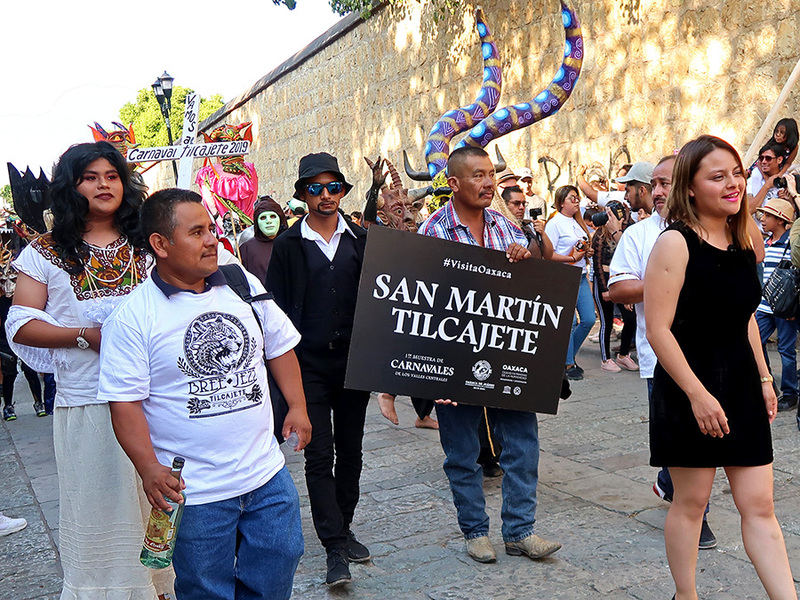 They were required to give two 4-minute oral presentations in front of five judges: Jorge Bueno Sánchez (city chronicler), Celia Florián (chef/owner of Las Quince Letras), María Concepción Villalobos (coauthor of Centéotl en los Lunes del Cerro), María Concepción Guzmán Concha (textile expert), and Claudio Sánchez Islas (writer and journalist). In the morning session of the competition, each was required to speak about their traditional cuisine, crafts, festivals, customs, myths and legends, or tourist attractions. 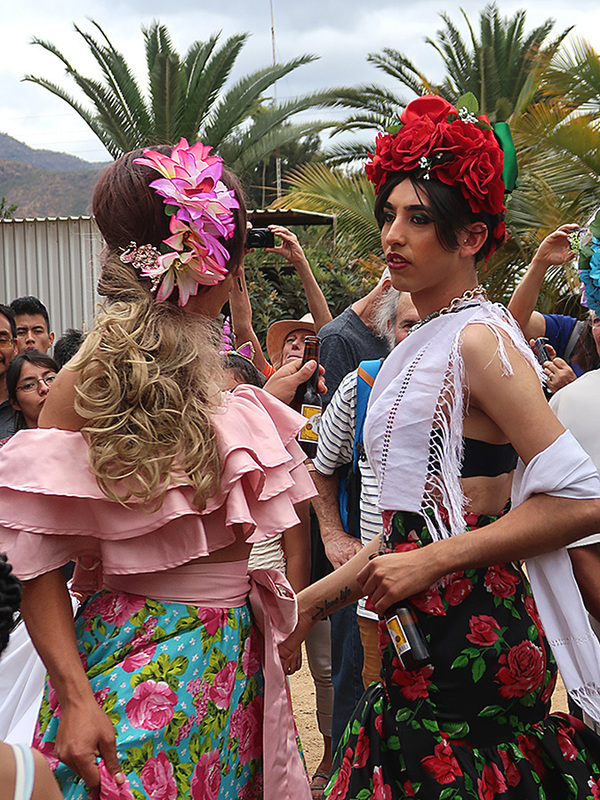 During the afternoon stage, each had to discuss the history, composition, elaboration, and utility of their costumes. 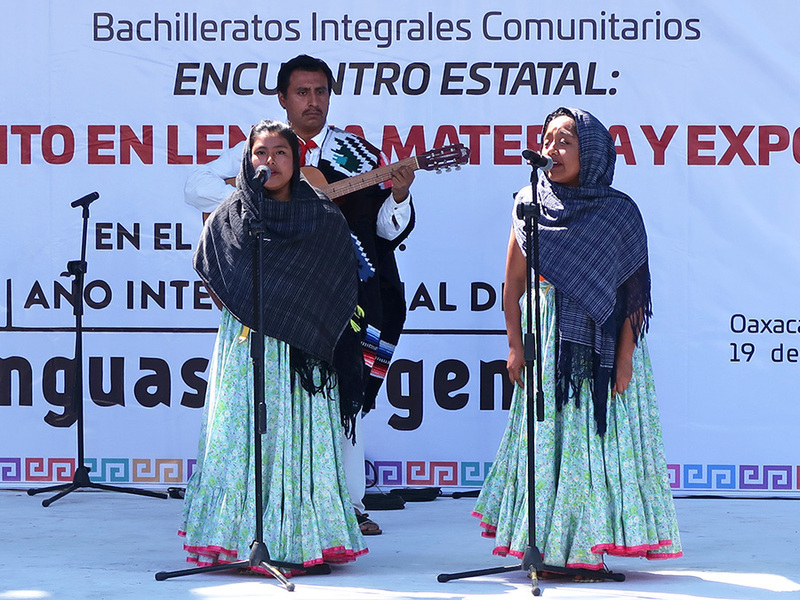 In addition, as Oaxaca has sixteen distinct ethnolinguistic groups, contestants from the various indigenous communities spoke several lines in their materna lengua (mother tongue). 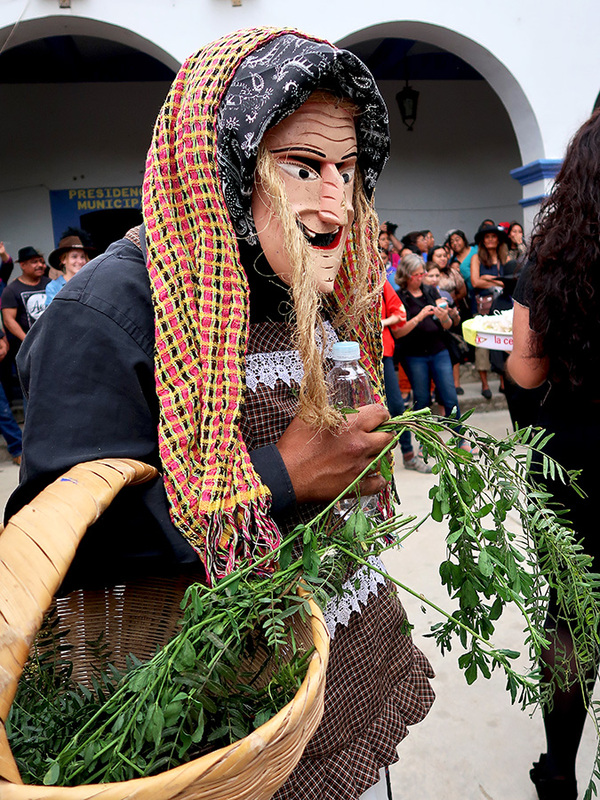 Rebeca Itahí Ortiz Santibañez, from San Melchor Betaza in the Sierra Norte region of the state. 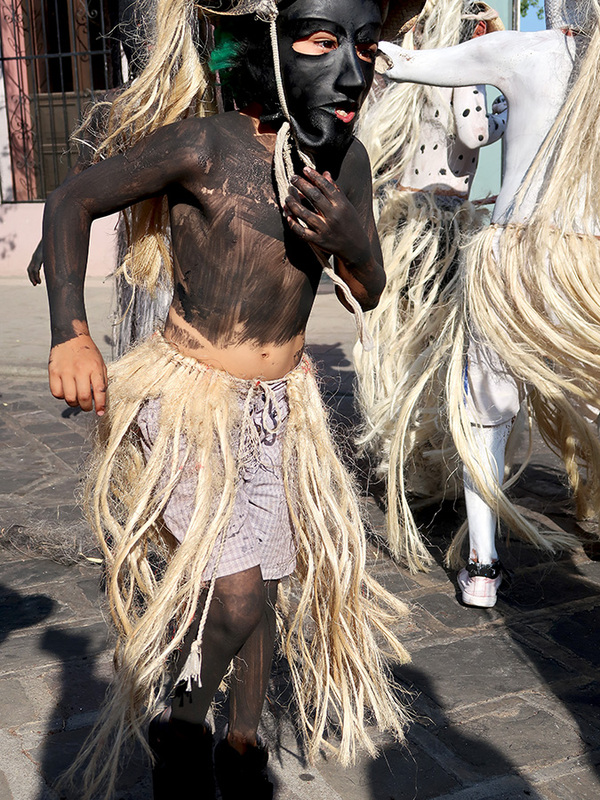 At being selected she exclaimed, “Doxhkenho dazhan” — Muchas gracias in Zapoteco. (ps) If anyone has or can find a list of all the contestants, I would really love to add their names and communities to each photo. I think they all deserve to be recognized. Despite 2000 miles between here and there, similarities abound between the two places I call home. Art on walls. 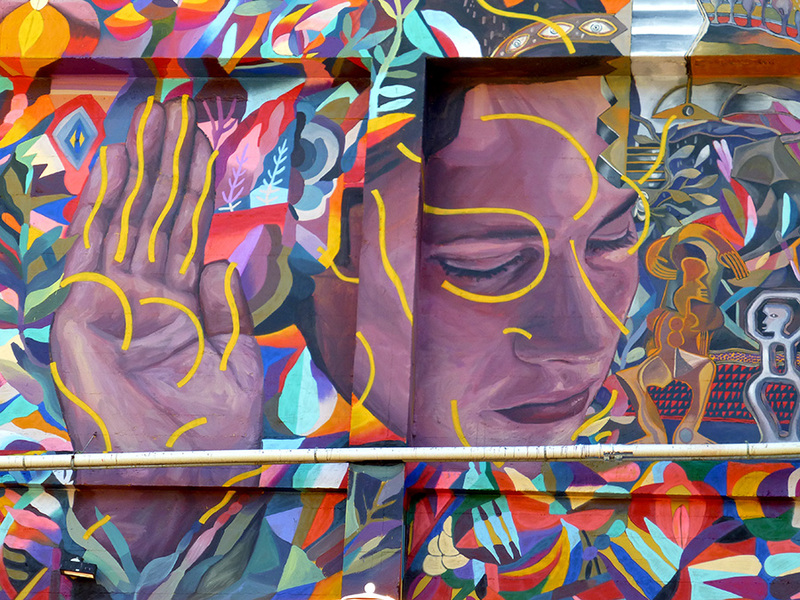 (Left) A massive new mural in Mill Valley, above the side wall of the Sequoia Theater, by Zio Ziegler. 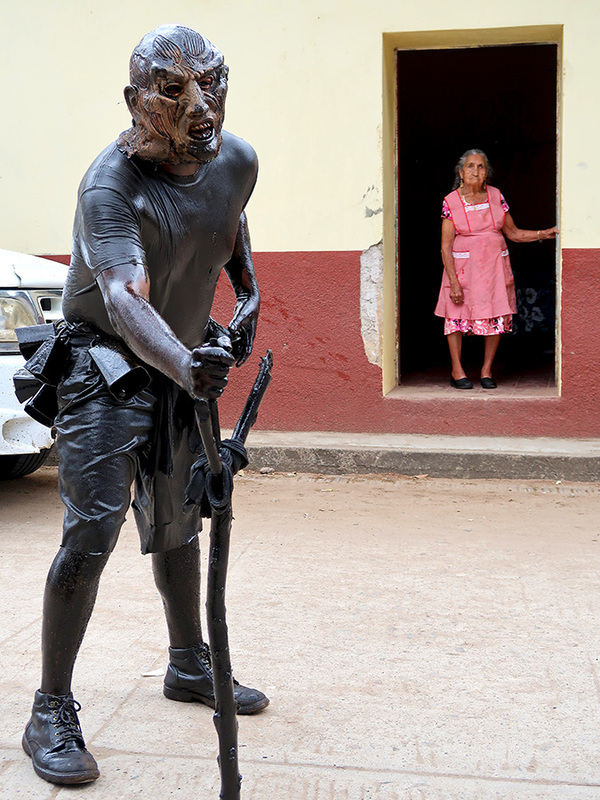 (Right) One of the many murals by Sanez (Fabián Calderón Sánchez) in Oaxaca. 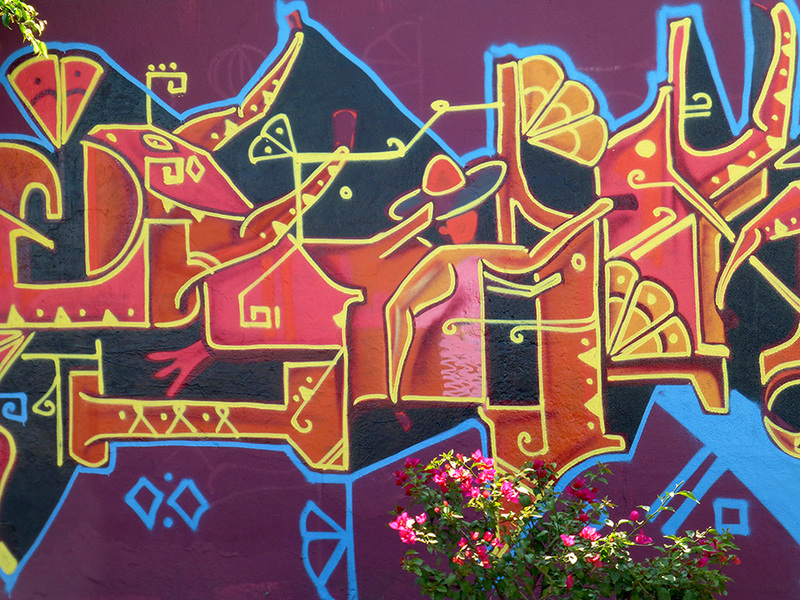 By the way, I’ve previously posted murals by both artists: click Sanez and/or Zio Ziegler. 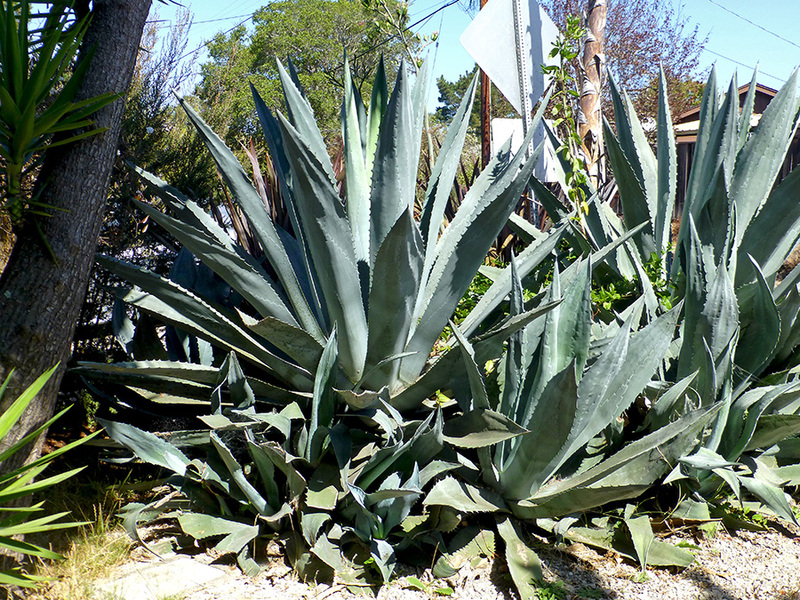 Agave. 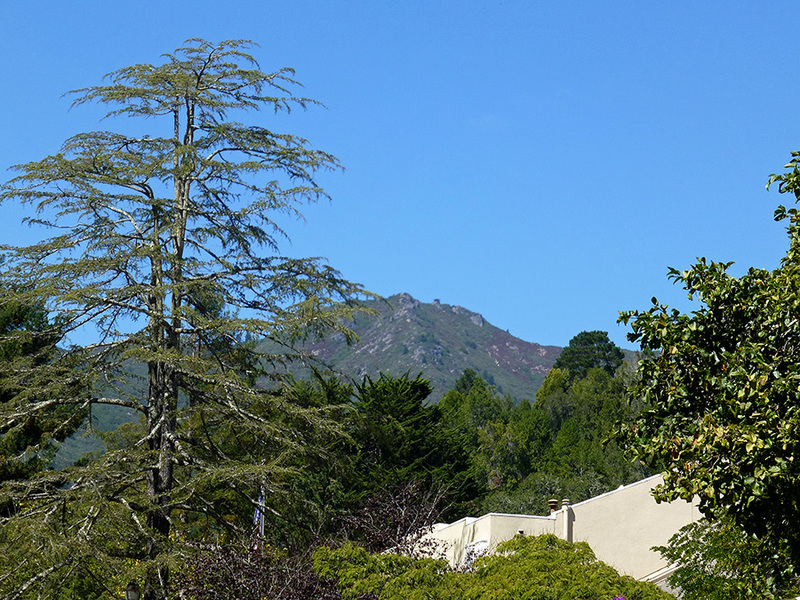 (Left) Of course in Mill Valley (California), it’s solely ornamental for those meticulously landscaped gardens. 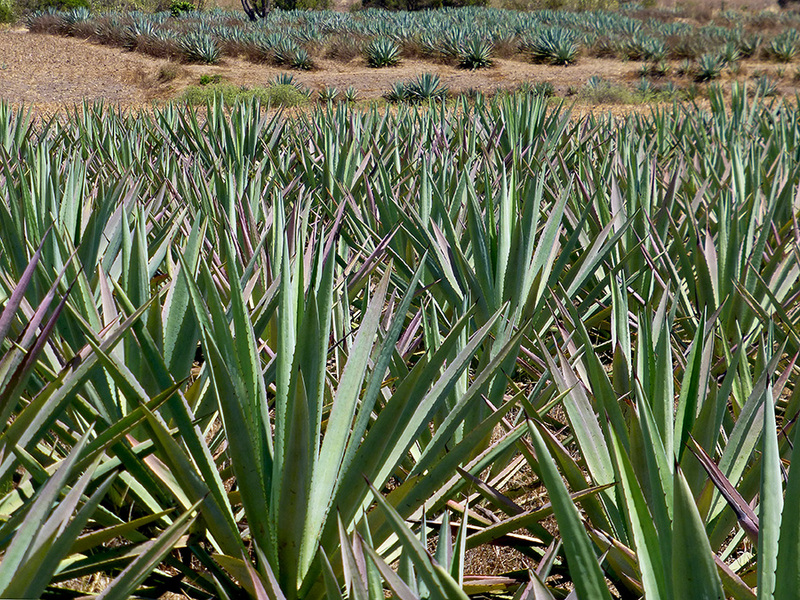 (R) Whereas in Oaxaca, it’s vital crop — land without agave means life without mezcal! Fluttering swags of flags. 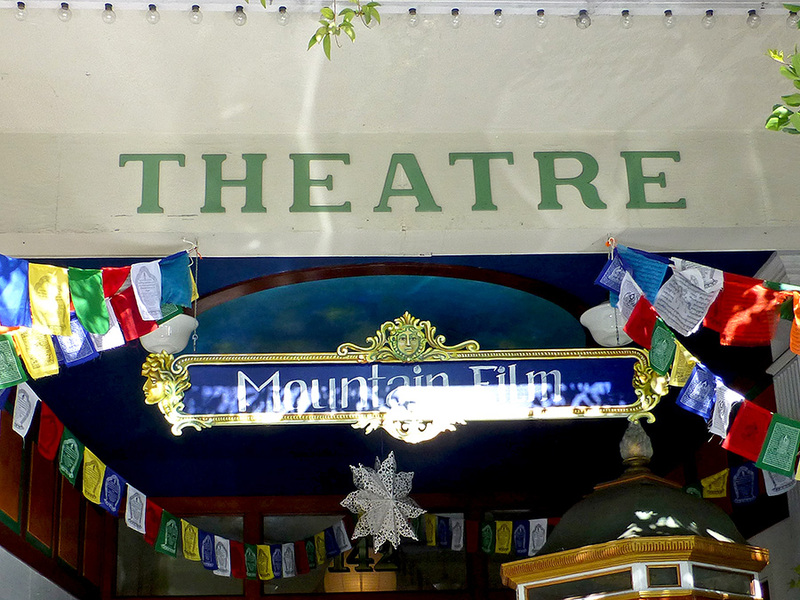 (Left) Cloth Tibetan prayer flags flying outside the 142 Throckmorton Theatre in Mill Valley welcome patrons to the Mountainfilm festival. 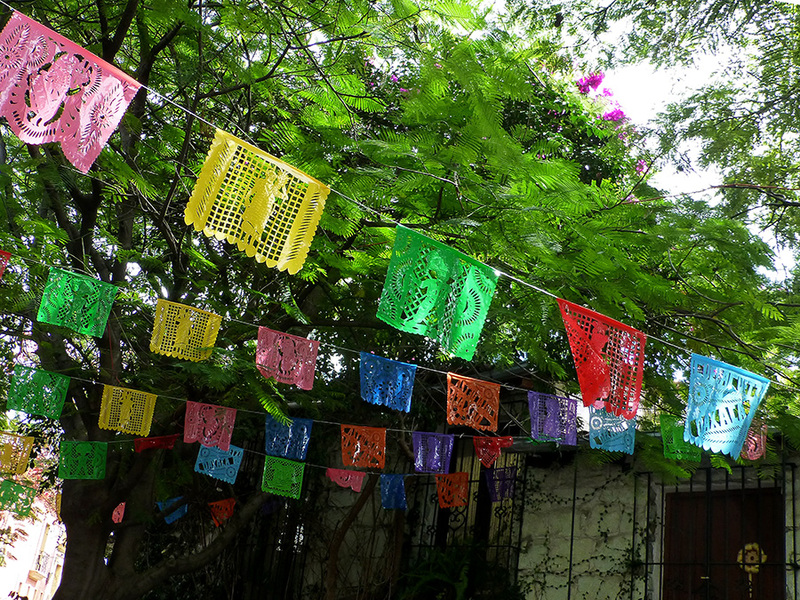 (Right) Ubiquitous papel picado found inside and out in Oaxaca, in paper or plastic, for events special or just because. Sacred mountains. (Left) Mt. Tamalpais, the Sleeping Lady and mountain of my childhood dreams, teen driving lessons, and adult peace, joy, and renewal. 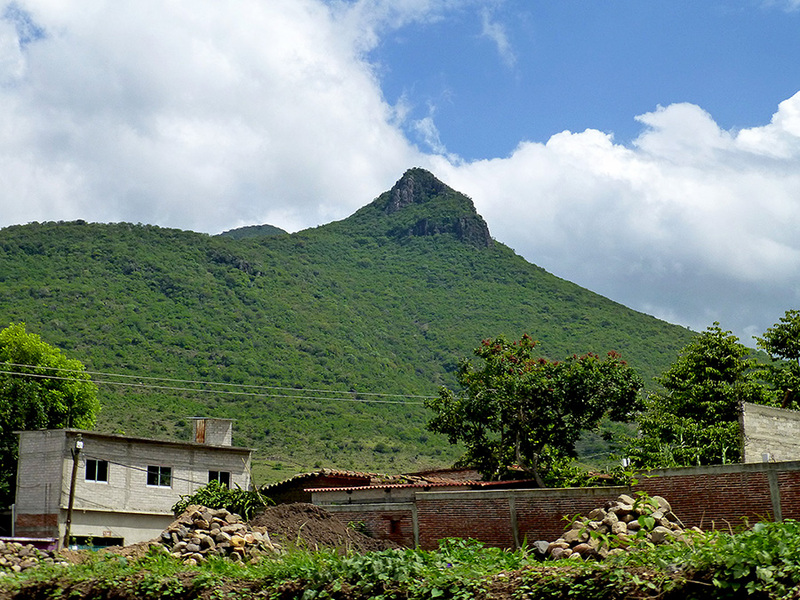 (Right) Cerro Picacho (in Zapoteco, Quie Guia Betz), brother/sister mountain — the sacred mountain in Teotitlán del Valle, where, among other times, villagers make a pilgrimage to the top on Día de la Santa Cruz (Day of the Holy Cross). 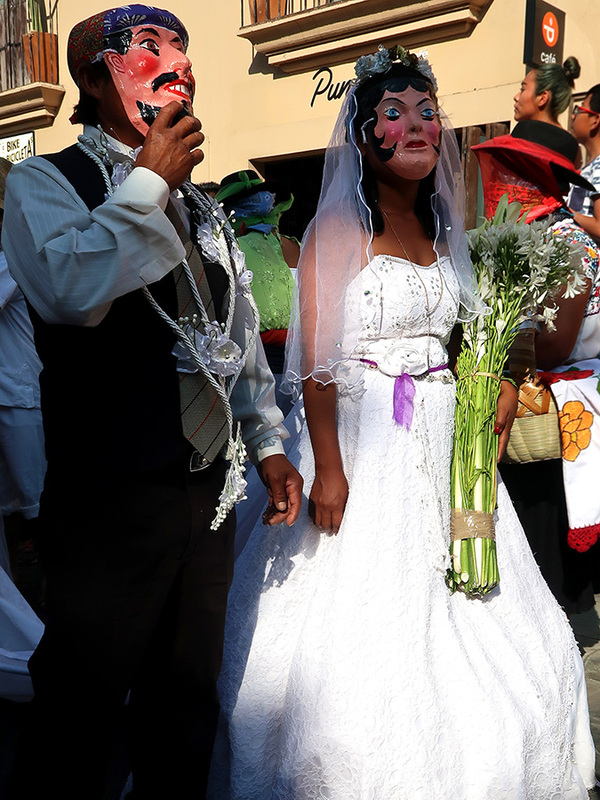 And, last but not least, colorfully costumed couples. (Left) Soon after arriving at the Mill Valley Fall Arts Festival, I ran into this twosome. 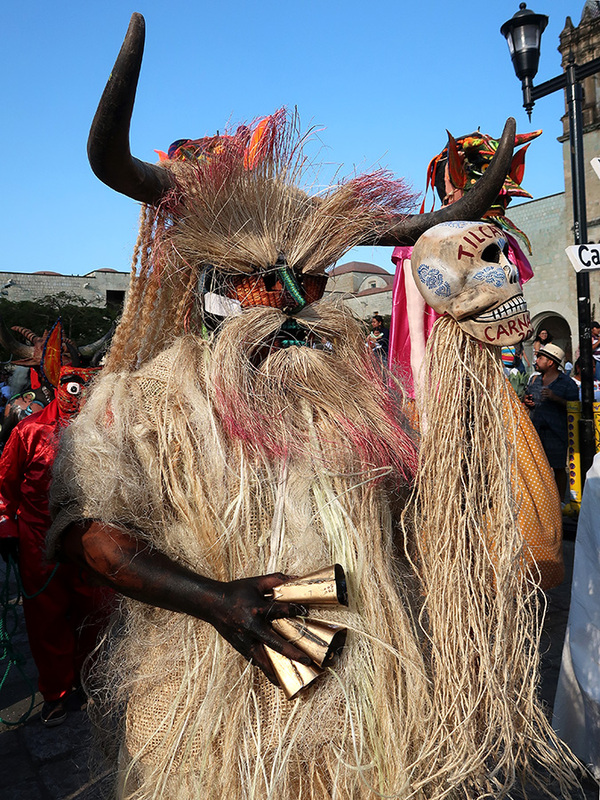 Turns out, in the “it’s a small world” universe, they are actually friends of a couple I know in San Miguel de Allende. 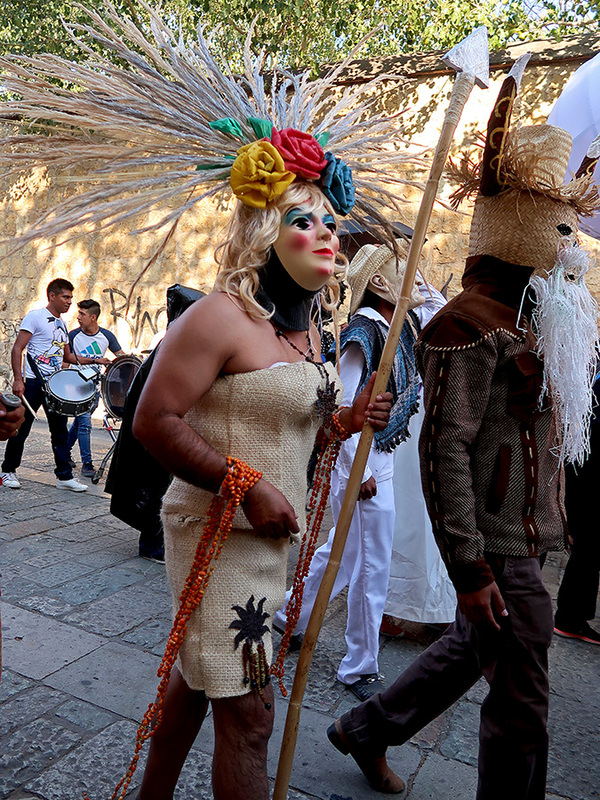 (Right) During July’s Guelaguetza in Oaxaca, the delegation from Putla de Guerrero representing their celebration of Carnaval, is garish and gaudy and wild and wacky — in other words, fantastic! 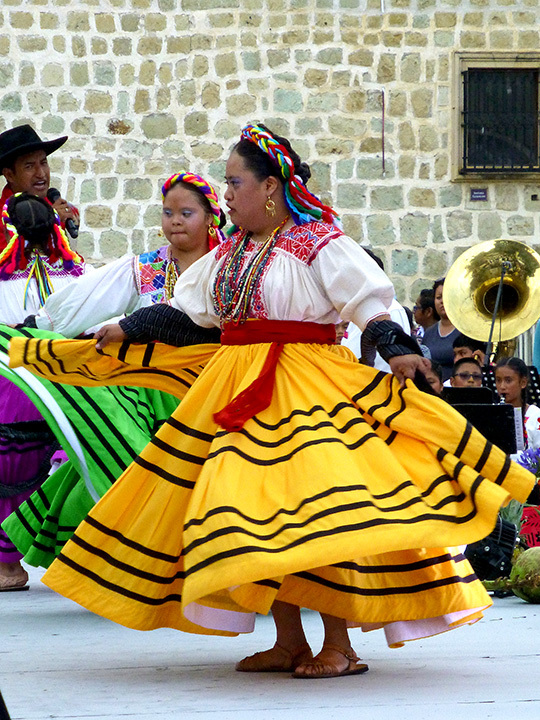 The celebration of Día Internacional de los Pueblos Indigenas continues in Oaxaca this weekend, with music, dance, food, and an artisan expo-venta (sale) in Jardín El Pañuelito. 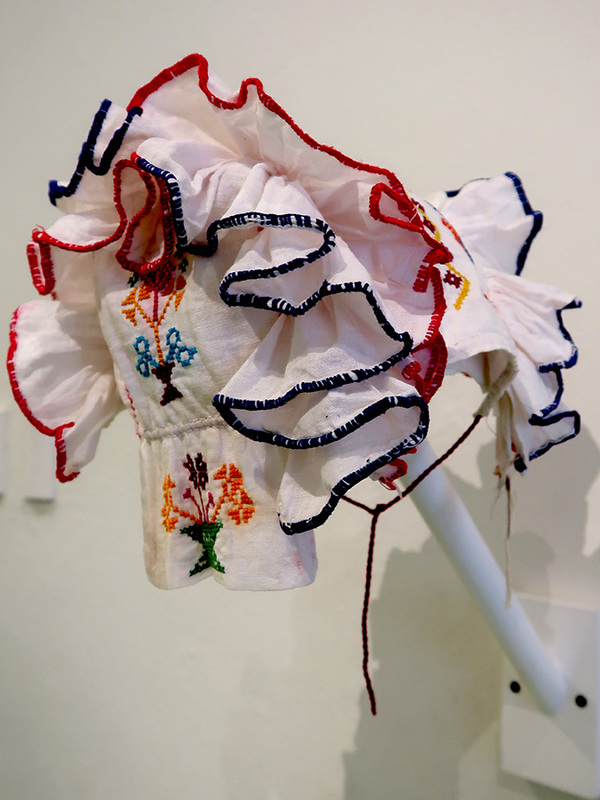 As I walked through the exposition, one woman’s embroidery drew me back for a second look. 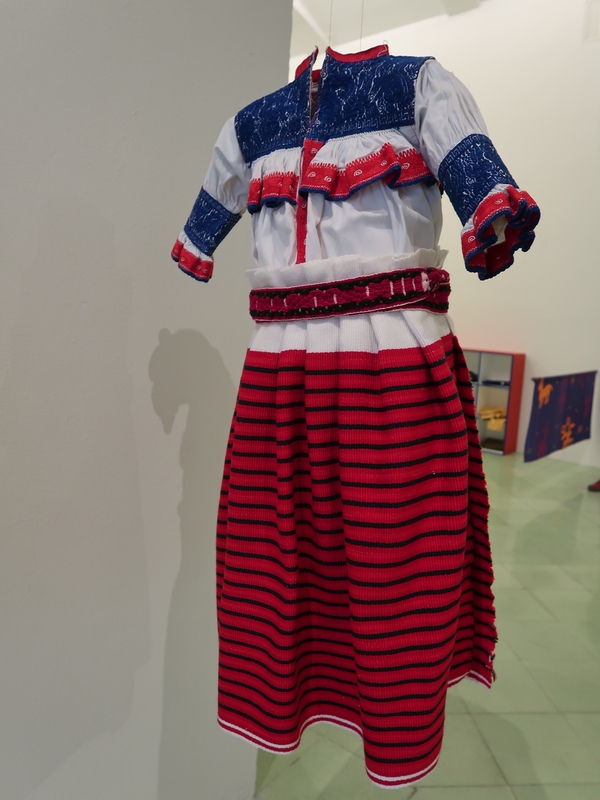 I was especially drawn to a huipil that had been hanging next to the one below. 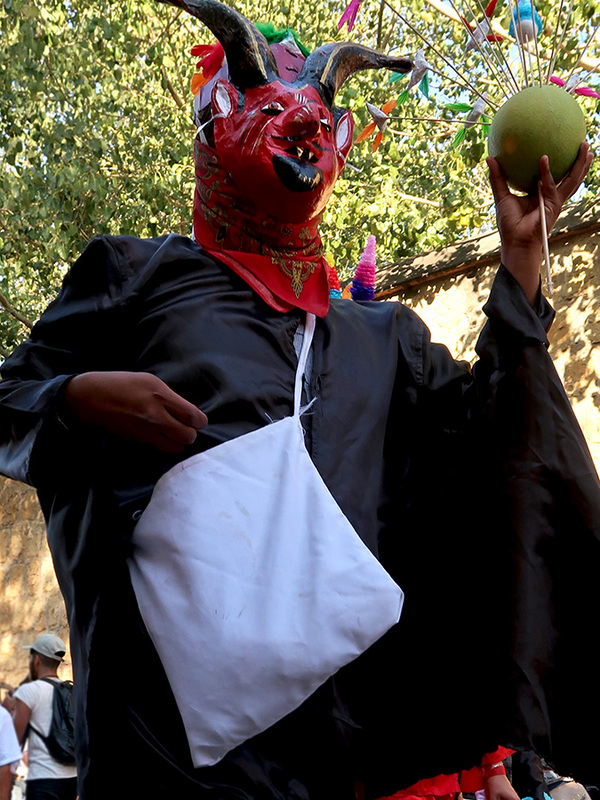 It’s not in this photo, because one of the “Diablos” from the Santiago Juxtlahuaca dance troupe (who were performing later) had already volunteered to climb up on a chair to take it down for her to show to me. However, before I could get my money out, a delegation of dignitaries came by for a photo shoot. 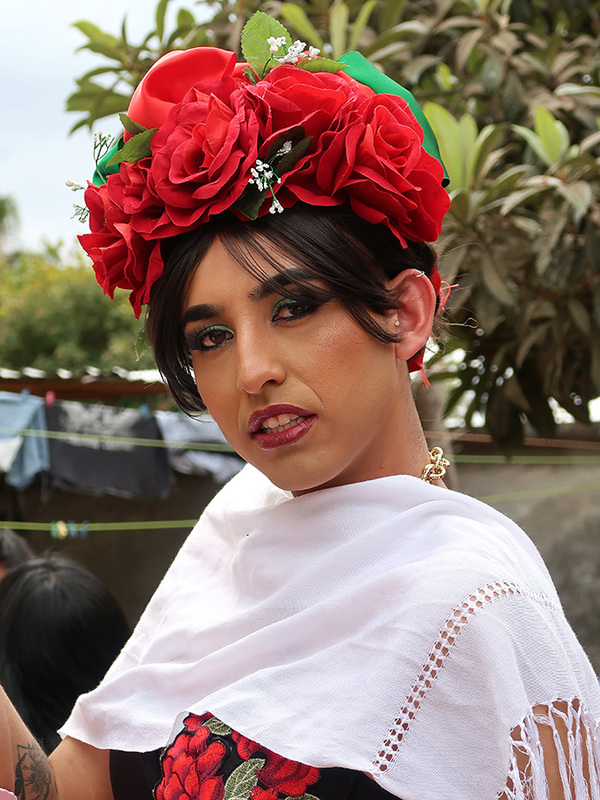 This popular and exceptionally talented woman is Carmen Vásquez Pérez, from San Mateo Yetla, Valle Nacional, located 172 kilometers northeast of Oaxaca city in the Papaloapan Region. 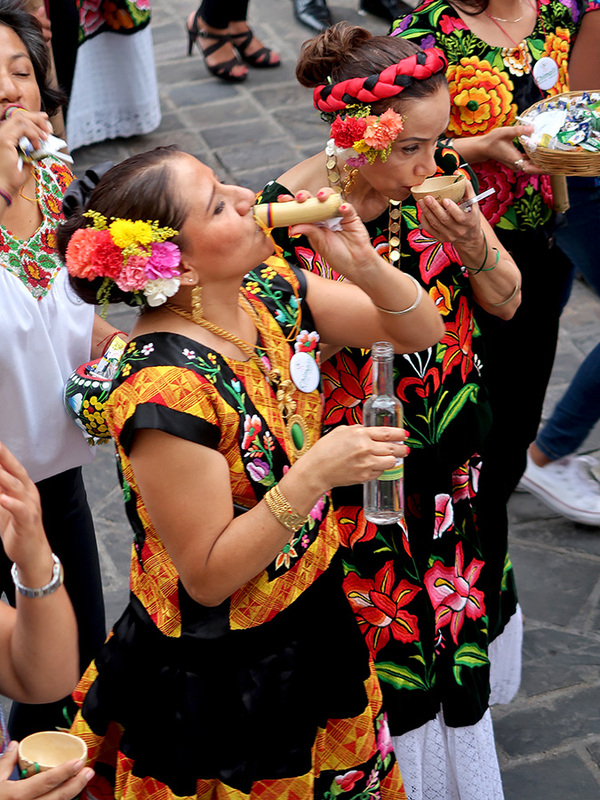 According to the article, Mujeres preservan bordado en Yetla, the village is surrounded by waterfalls and lush vegetation and is rich in Chinanteca customs. 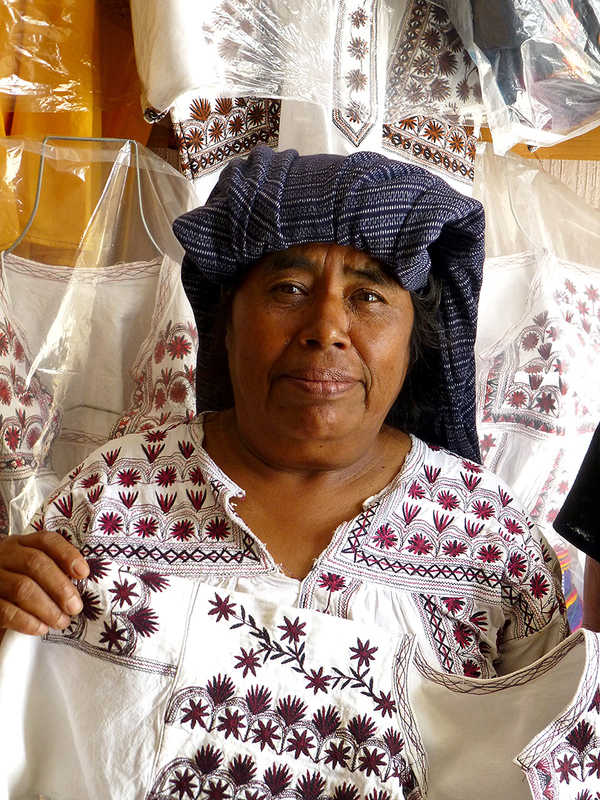 Doña Carmen learned to embroider as a child and has been instrumental in an effort to preserve and promote the local traditional designs and techniques. As you can see below, her workmanship is exquisite. After returning home and doing a little research, I’m even more pleased with my purchase. And, by the way, I did not “bargain” — my new treasure is worth every peso of its 600 peso price tag, and then some! 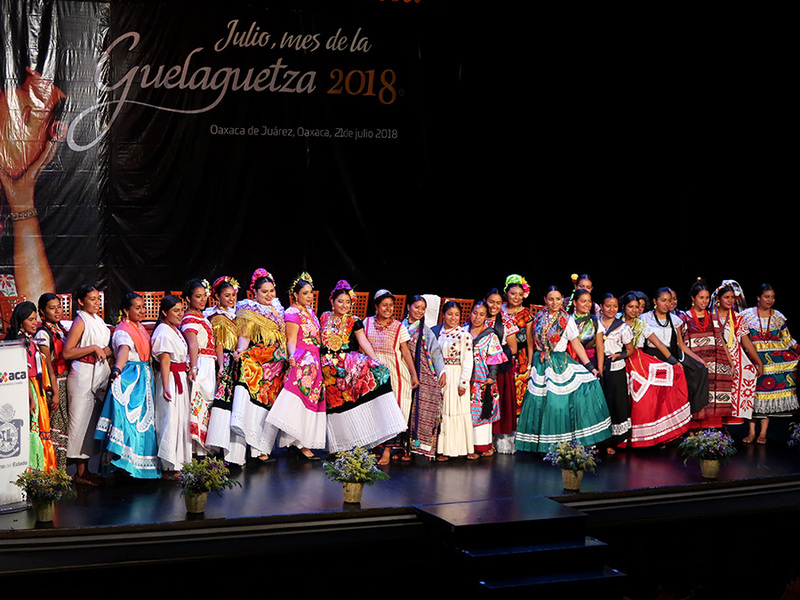 The Plaza de la Danza was filled with cheering crowds early Sunday evening as ten girls and eight boys from Los Ángeles de Luz took the stage for the 13th edition of this very special Guelaguetza. Perhaps it is because I have a special needs nephew or that both my sister-in-law and daughter-in-law are special ed teachers that I am drawn to this event every year. 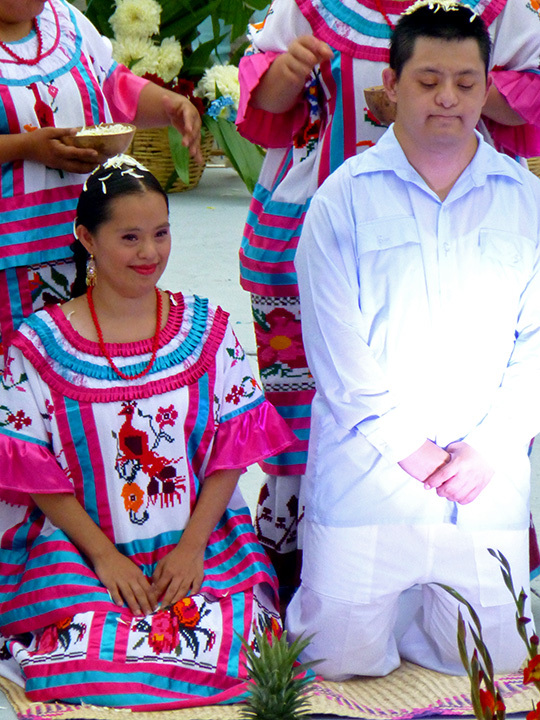 In any case, the joy and pride exhibited by these young people with Down’s Syndrome, as they make the requisite costume changes and perform traditional dances from the eight regions of Oaxaca, always lifts my heart. I had to leave before it ended, but hopefully through this slideshow I can share a little of the professionalism and accomplishment of these performers and the emotion experienced by those of us who had the privilege of being in the audience. And, I would like to add, for those of us watching their performance, it facilitates our acceptance of those who many be a little different from us. 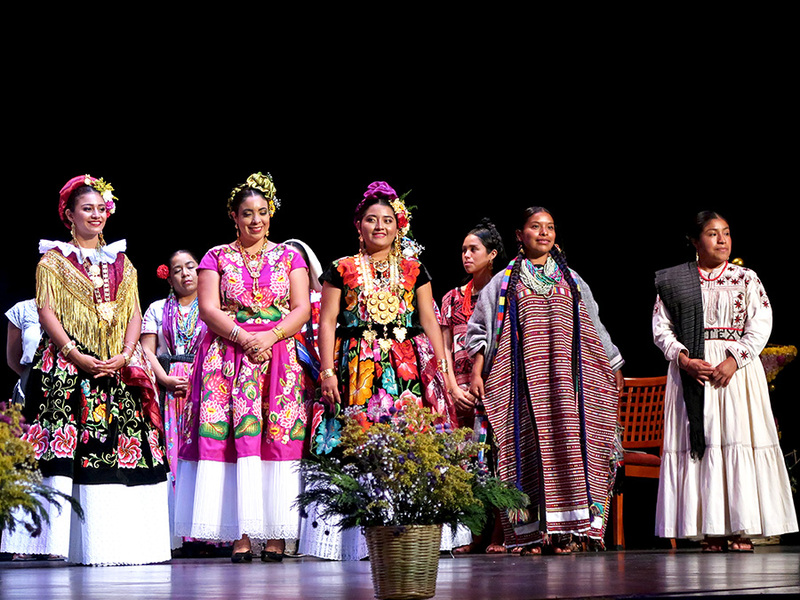 If you are in Oaxaca for next year’s Guelaguetza festivities, try to attend this heartwarming and uplifting event. 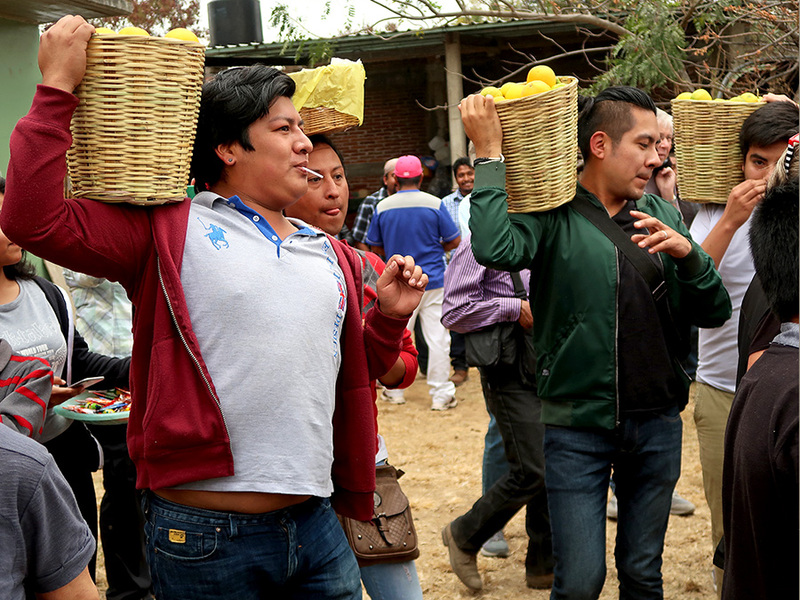 Also, there is always a calenda (parade) a couple of days before AND scrambling for gifts tossed into the crowd after each dance. Last Saturday, in the end, it did not rain on the parade. 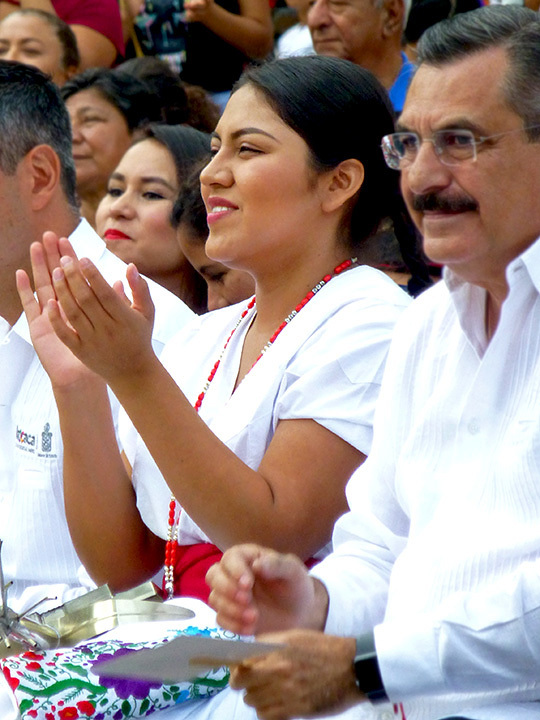 With only minutes to spare before the first desfile of the Guelaguetza delegations was to begin, the torrential downpour stopped, the rockets sounded, bands played, and the delegates danced their way down Independencia. I can’t believe how UN-bedraggled and energetic they were! Here’s hoping I managed to include one photo from each of the delegations in the slideshow above. 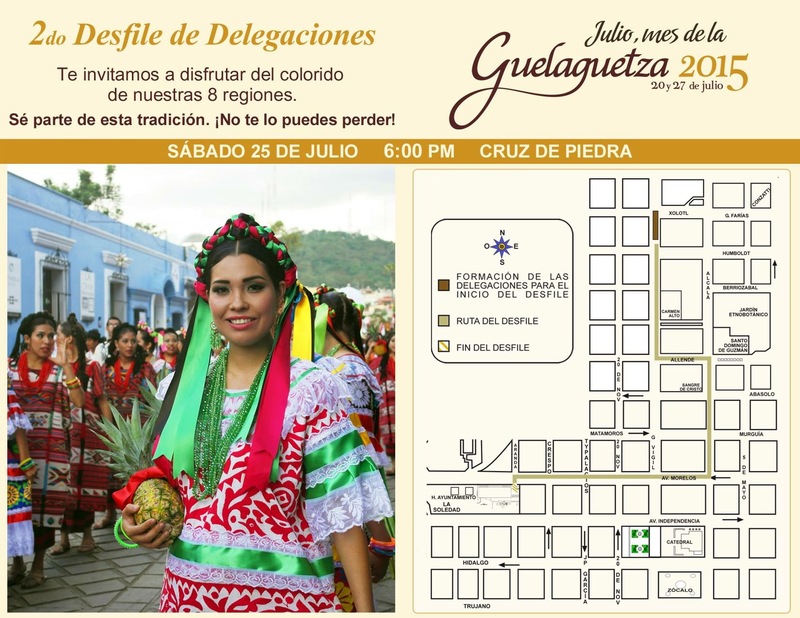 By the way, if you are in Oaxaca and planning to attend the second desfile tomorrow (July 25), see below for the parade route — it has been changed! 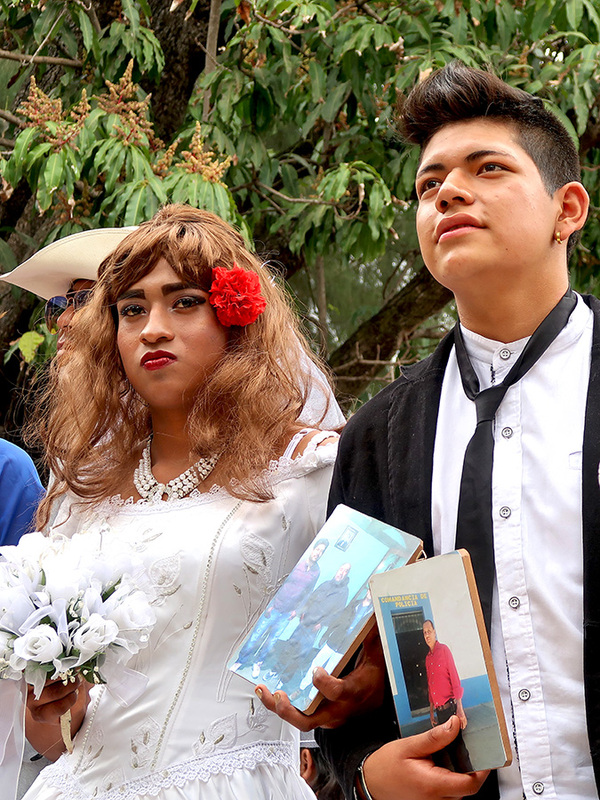 Before the rains came to put a damper on Saturday’s Guelaguetza pre-parade photo-ops, there were these moments with with moms and dads readying their impossibly cute kids for the desfile. This last was my favorite moment. I think dad was hoping for a lovely portrait of his beautiful daughter in all her finery, but as he began to take her digital device away, she gave him a look that said, “If you think your going to get a smile out of me, you’ve got another think coming.” So, I said, let her keep it — still no smile, but there was another hour before the scheduled start time and parental experience told me, better to keep her occupied! 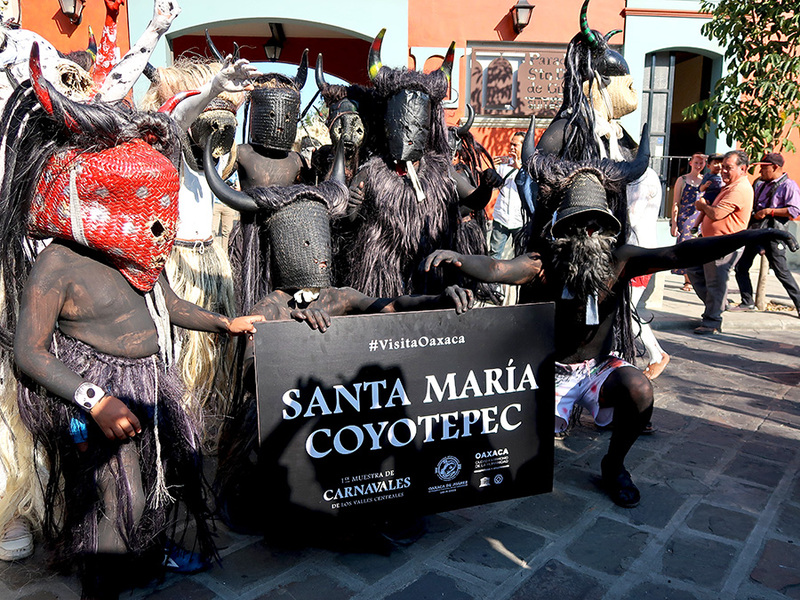 Blogger buddy Chris and I have been talking about returning to Santa María Tlahuitoltepec since our first visit in May 2013. Time flies when you’re having fun and it took the current Theft of a cultural kind controversy to motivate us to hit the long and winding road up into the Mixe. 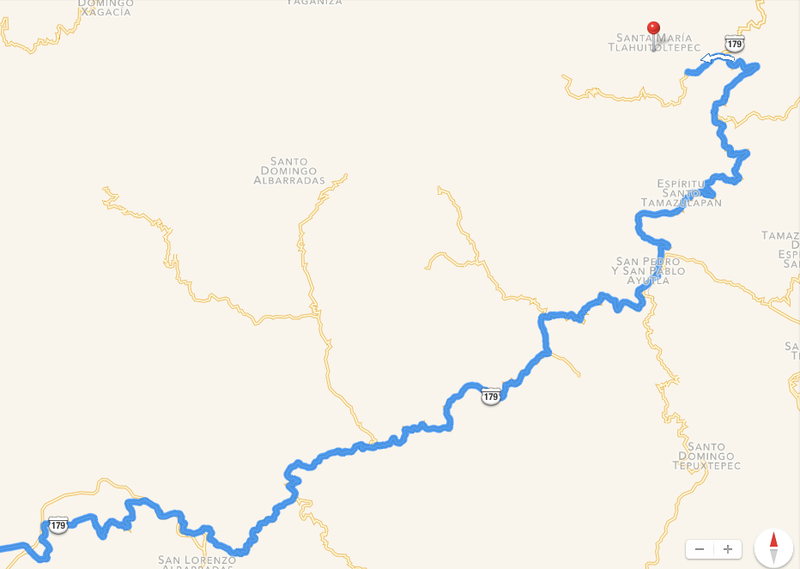 To reach our our journey’s end in the Sierre Norte, our road trip took a little over two and a half hours from the city — on a much improved route 179, I might add. 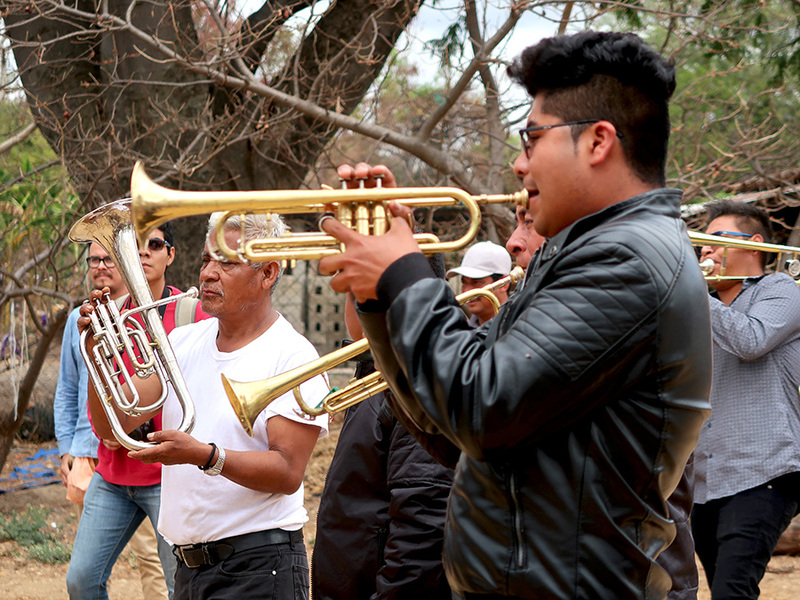 Reaching the center of town, known for its musical literacy and textiles, Tejas, a youth band, was warming up on the multipurpose municipal basketball court. 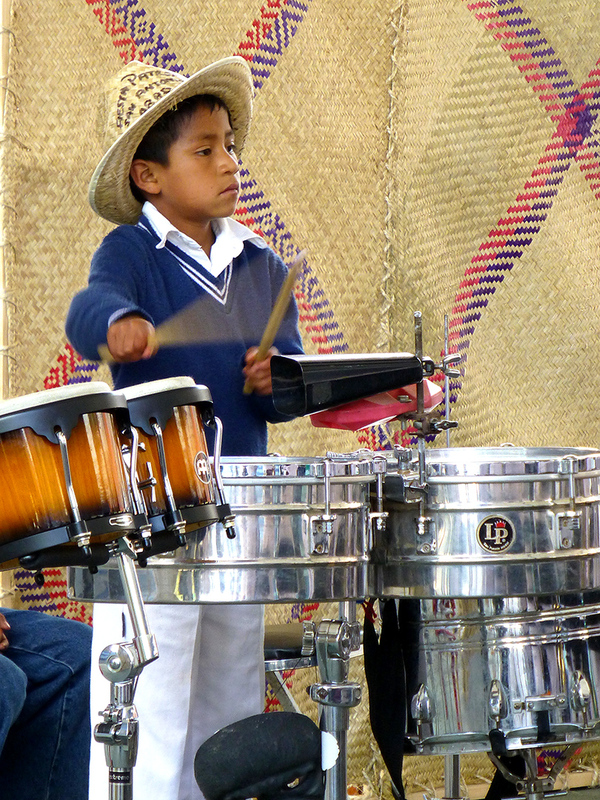 Their performance was part of the Domingos de Concierto (concert Sundays). 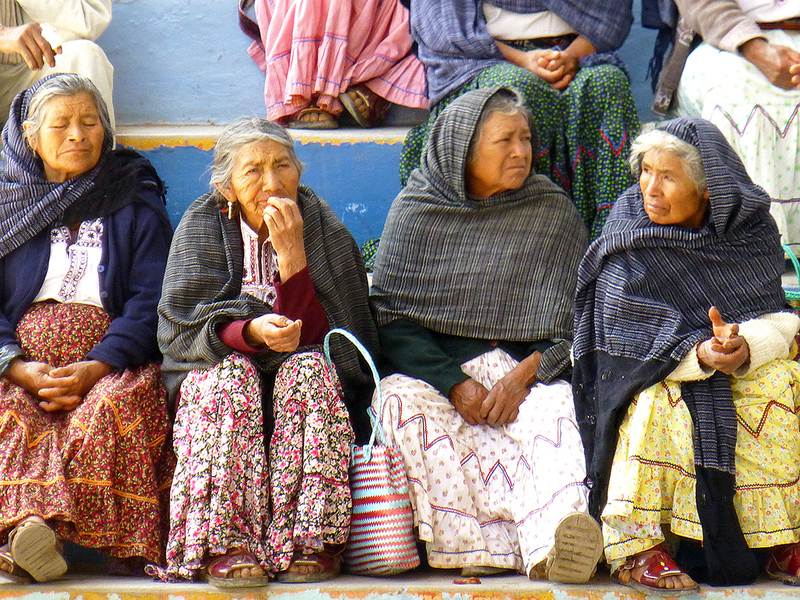 We joined villagers to watch and listen. 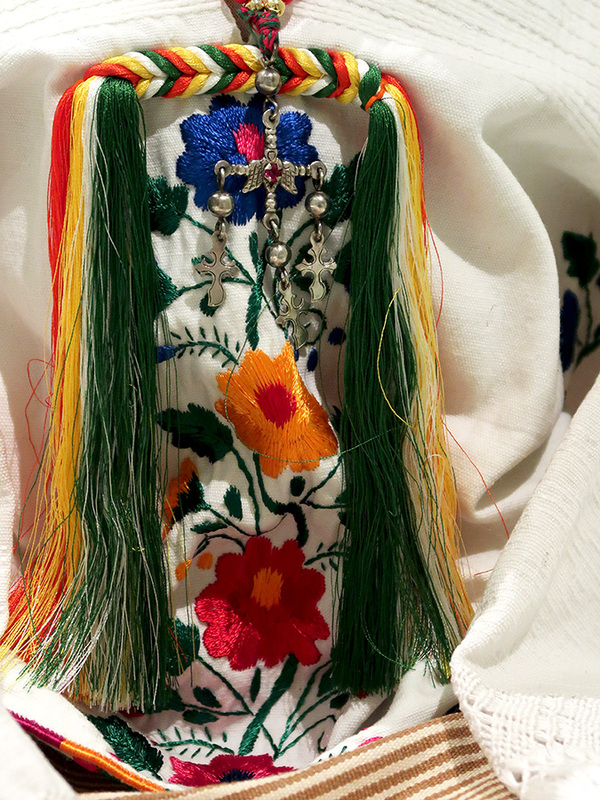 Most all of the women “of a certain age” were wearing the traditional dress that is a symbol of this community. 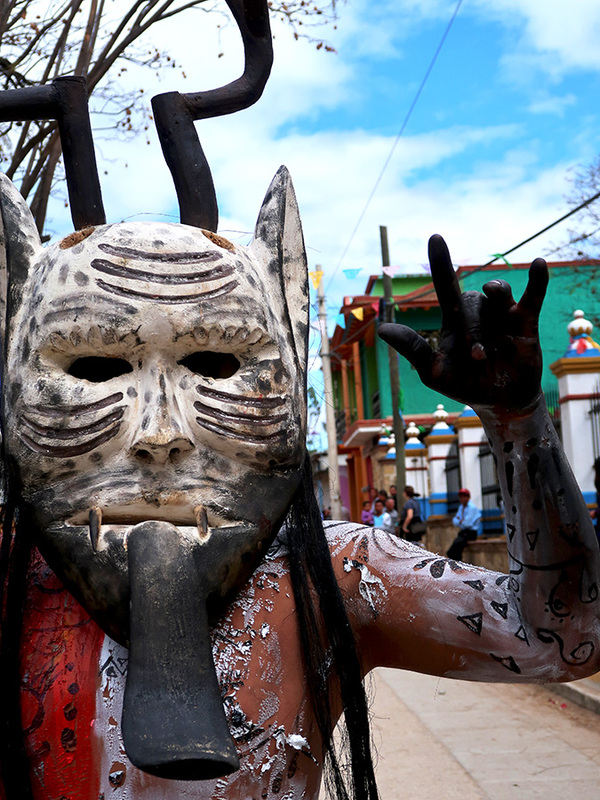 However, our stomachs began grumbling and led us in search of comida. The comedor we had been directed to wasn’t open but there were women sitting under the portales selling tamales. This gal’s amarillo tamales (3 for 10 pesos) were muy sabrosos! Once we had eaten, fed a couple of street dogs the crumbs (until a woman walking softly and carrying a big stick, chased them away), and our energy levels were restored, we walked across the street to the sextagonal textile kiosk — the day’s destination. We headed to Artesanias Kojpk Okp, the tiendita of Doña Honorina Gómez Martínez, the embroiderer we had met on our previous visit to Tlahuitoltepec. Ahhh, yes, she was well aware of the Inspiration or plagiarism dispute with French designer, Isabel Marant, that even Vogue UK has covered. 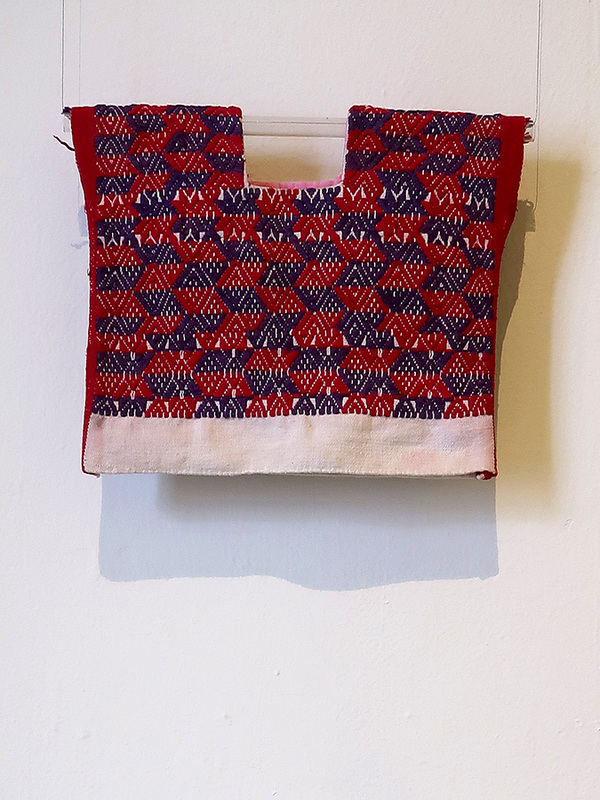 As I later discovered, she spoke for the embroiderers at the press conference held at Oaxaca’s Textile Museum ten days ago. 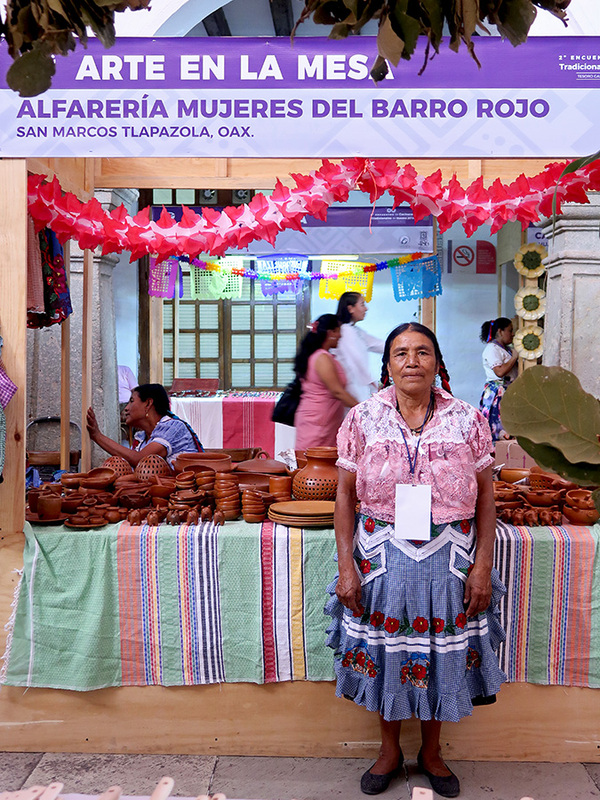 Should you be inclined to go to the source, but can’t manage a trip up into the Mixe, as always, she will have a stall in July at the special artisan market in Oaxaca city during La Guelaguetza. 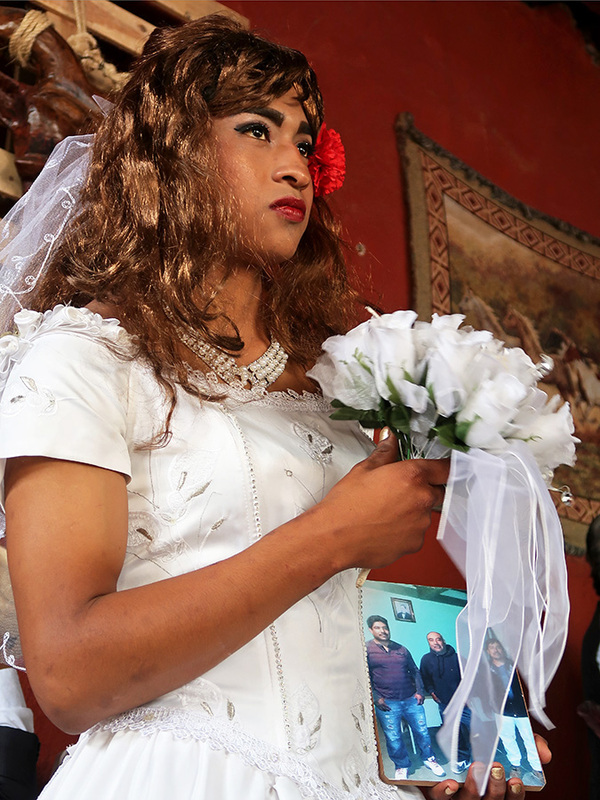 She can also be contacted by telephone: 01 283 596 26 05 and cell: 951 198 79 42.